Keziah's sister Anna married settler Jabez Partridge. grandsons Hubbard, Edmond, and David. 1. BENJAMIN6 KENDALL (BENJAMIN5, THOMAS4, THOMAS3, FRANCIS MILES2, JOHN1) was born 18 Mar 1744 in Sherborn MA, and died 1841 in Gardner MA. 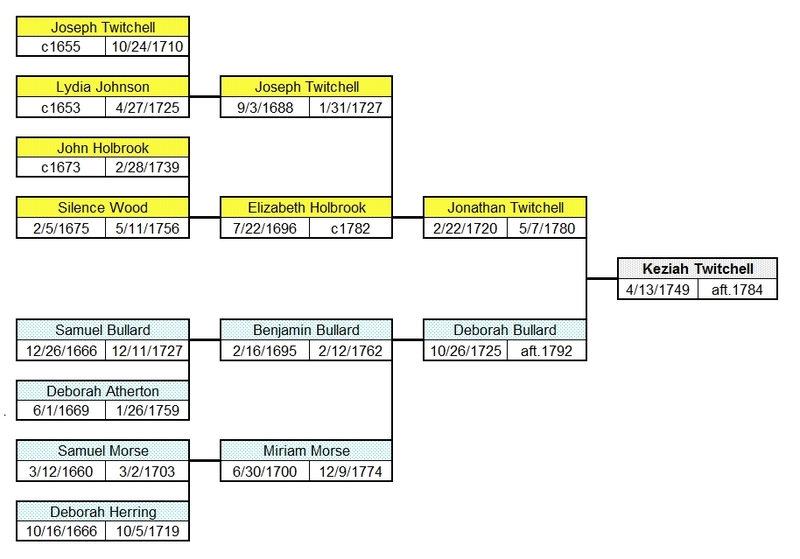 He married KEZIAH TWITCHELL 01 Apr 1768 in Sherborn MA, daughter of JONATHAN TWITCHELL and DEBORAH BULLARD. She was born 13 Apr 1749 in Sherborn MA, and died Aft. 1784. 2. i. ASAPH7 KENDALL, b. Abt. 1769, MA; d. 02 Oct 1851.
ii. REBECCA KENDALL, b. 02 Jun 1771, Sherborn MA; d. 31 Oct 1774, Sherborn MA. 3. iii. JONATHAN KENDALL, b. 24 Apr 1773, Sherborn MA; d. Bet. 1855 - 1863. 4. iv. REBECCA KENDALL, b. 17 Oct 1775, Sherborn MA; d. 31 Aug 1839, Gardner MA. 5. v. MARTIN KENDALL, b. 08 Sep 1778, Sherborn MA; d. 29 May 1863, Winhall VT.
vi. ANNA KENDALL, b. 20 Jun 1781, Sherborn MA; m. MARSHALL STODDARD; b. 04 Oct 1781, Hingham MA. 6. vii. MIRIAM KENDALL, b. 12 Mar 1784, Gardner MA; d. Aft. 1820.
viii. KEZIAH KENDALL, b. Abt. 30 Mar 1794, Gardner MA. 2. ASAPH7 KENDALL (BENJAMIN6, BENJAMIN5, THOMAS4, THOMAS3, FRANCIS MILES2, JOHN1) was born Abt. 1769 in MA, and died 02 Oct 1851. He married (1) EUNICE CASE 27 Nov 1794 in Haverhill MA. She was born Abt. 1769, and died 18 May 1808 in Haverhill MA. He married (2) HANNAH BACHELLOR 16 Aug 1808 in Haverhill MA. She was born Abt. 1778, and died 03 Dec 1853 in Portland ME. i. WILLIAM BODEN8 KENDALL, b. 29 Jun 1795, Haverhill MA; d. 12 Apr 1867, Boston MA; m. ELIZA GREENOUGH, 29 Apr 1819, Haverhill MA; b. Abt. 1800, NH; d. Aft. 1855.
ii. MARY STEWART KENDALL, b. 27 Apr 1798, Haverhill MA. 7. iii. BENJAMIN JOHN KENDALL, b. 29 May 1800, Haverhill MA; d. 01 Apr 1881.
iv. ASAPH KENDALL, b. 22 Jan 1802, Haverhill MA. 8. v. JAMES HENRY KENDALL, b. 23 Jun 1803, Haverhill MA; d. 28 Apr 1877, Berkley MA. 9. vi. ANN BETHIAH WHITMORE KENDALL, b. 03 Mar 1805, Haverhill MA; d. 28 May 1895, Beverly MA. vii. TIMOTHY KENDALL, b. Jul 1806, Haverhill MA; d. 20 Feb 1809, MA. 10. viii. DANIEL BRACKETT KENDALL, b. 11 May 1808, Haverhill MA [5/12/1808 Danvers MA]; d. 1889, Retreat WI. ix. MARY ELIA8 KENDALL, b. Abt. 1810; d. 23 Nov 1820, Haverhill MA. x. GEORGE KENDALL, b. Abt. 1814; d. 03 Jan 1843, Portland ME. 3. 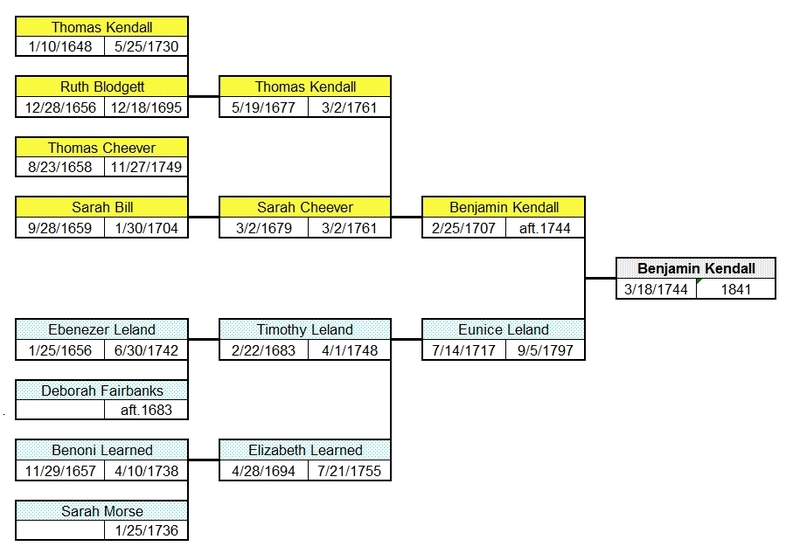 JONATHAN7 KENDALL (BENJAMIN6, BENJAMIN5, THOMAS4, THOMAS3, FRANCIS MILES2, JOHN1) was born 24 Apr 1773 in Sherborn MA, and died Bet. 1855 - 1863. He married MARY NICHOLS 19 Jun 1794 in Gardner MA, daughter of DAVID NICHOLS and REBECCA BURNAP. She was born 05 May 1773 in Westminster MA, and died 09 Feb 1863 in Gardner MA. i. ASAPH8 KENDALL, b. 03 Sep 1794, Gardner MA. 11. ii. HUBBARD KENDALL, b. 18 Apr 1796, Gardner MA; d. 07 Feb 1855, Gardner MA. iii. MOSES KENDALL, b. 16 May 1798, Gardner MA; d. 23 Apr 1867, Hubbardston MA; m. ESTHER J BULLOCK, 30 Dec 1847; b. Abt. 1811, NH; d. Aft. 1880. 12. iv. EUNICE KENDALL, b. 17 Oct 1800, Hubbardston MA; d. 27 Mar 1873, Gardner MA. v. ORRISON KENDALL, b. 10 Mar 1803, Hubbardston MA; d. 05 Apr 1880, Gardner MA. 13. vi. EDMUND KENDALL, b. 18 Apr 1805, Hubbardston MA; d. 18 Jun 1848, Gardner MA. vii. CRUSOE KENDALL, b. 18 Aug 1807, Hubbardston MA; d. 26 May 1843, Hubbardston MA. 14. viii. REBECCA KENDALL, b. 24 Feb 1810, Hubbardston MA; d. 06 Aug 1889, Winchendon MA. 15. ix. MARY KENDALL, b. 12 Feb 1812, Hubbardston MA; d. 14 Mar 1856, Warwick MA. 16. x. FANNY KENDALL, b. 03 Apr 1814, Hubbardston MA; d. 03 Oct 1849, Gardner MA. xi. HARRISON KENDALL, b. 21 Nov 1816, Hubbardston MA; d. 15 Oct 1817, Hubbardston MA. 4. REBECCA7 KENDALL (BENJAMIN6, BENJAMIN5, THOMAS4, THOMAS3, FRANCIS MILES2, JOHN1) was born 17 Oct 1775 in Sherborn MA, and died 31 Aug 1839 in Gardner MA. She married HUBBARD DUNSTER 18 May 1797 in Westminster MA, son of HUBBARD DUNSTER and RUTH BAILEY. He was born 04 Oct 1772 in Westminster MA, and died 03 Dec 1818 in Gardner MA. i. MARTIN8 DUNSTER, b. 03 Jan 1798, Gardner MA; d. 02 Dec 1854, Quincy IL; m. SALLY NICHOLS, 13 Feb 1823, Westminster MA [int 11/9/1822 Gardner MA]; b. Abt. 1799, Westminster MA; d. 02 Jul 1845, Gardner MA. ii. PRUDA DUNSTER, b. 23 Jan 1800, Gardner MA; d. Aft. 1819; m. ISAAC FITTS, 14 Nov 1819, [10/17/1819] Gardner MA; b. 20 Dec 1796, Royalston MA; d. Aft. 1819. 17. iii. REBECCA DUNSTER, b. 11 Feb 1802, Gardner MA; d. Bet. 1850 - 1855.
iv. LOUISA DUNSTER, b. 18 Feb 1805, Gardner MA; d. 10 Aug 1875, Gardner MA. 18. v. ASAPH DUNSTER, b. 06 Jul 1807, Gardner MA; d. Aft. 1860.
vi. MARY JANE DUNSTER, b. 12 Nov 1809, Gardner MA; d. Aft. 1832; m. STEPHEN G TYLER, 27 Oct 1832, Berlin MA; b. 25 Feb 1809, Leominster MA; d. Aft. 1880. 19. vii. LYDIA DUNSTER, b. 24 Jan 1816, Gardner MA; d. 05 Apr 1863, Gardner MA. 20. viii. DAPHENY LELAND DUNSTER, b. 18 Jul 1818, Gardner MA; d. 21 Mar 1891, Maeser UT. 5. MARTIN7 KENDALL (BENJAMIN6, BENJAMIN5, THOMAS4, THOMAS3, FRANCIS MILES2, JOHN1) was born 08 Sep 1778 in Sherborn MA, and died 29 May 1863 in Winhall VT. He married PRUDENCE KENDALL 13 Oct 1799 in Leominster MA, daughter of DAVID KENDALL and PRUDENCE HARTWELL. She was born 06 Apr 1782 in Leominster MA, and died 27 Dec 1830 in Gardner MA. i. MYRANDA8 KENDALL, b. 1799, Leominster MA; d. 31 Dec 1870, Gardner MA. 21. ii. ISAAC P KENDALL, b. 06 Sep 1801, Gardner MA; d. 11 Dec 1883, Gardner MA. 22. iii. MARY KENDALL, b. 08 Sep 1803, Gardner MA; d. 04 Apr 1875, Templeton MA. iv. ALVIN KENDALL, b. 13 Dec 1805, Gardner MA; d. 08 Feb 1849, Ashburnham MA; m. HANNAH BEMIS; b. 08 Jul 1812, Westminster MA; d. 11 Jun 1886. 23. v. ANNIS KENDALL, b. 18 Dec 1807, Gardner MA; d. 23 Apr 1863, Gardner MA. 24. vi. DAVID KENDALL, b. 27 Feb 1810, Gardner MA; d. 05 Feb 1898, Gardner MA. vii. ADALINE KENDALL, b. 23 May 1812, Gardner MA; d. 30 Sep 1881, Waltham MA; m. RUFUS STICKNEY, 16 Feb 1841, Templeton MA; b. Abt. 1813, Whitingham VT; d. 30 Aug 1891, Waltham MA. 25. viii. BARTLETT STODDARD KENDALL, b. 25 Mar 1814, Gardner MA; d. 16 Jan 1881, VT.
26. ix. BENJAMIN F KENDALL, b. 30 Jun 1816, Gardner MA; d. 01 Jan 1892, Gardner MA. x. MARTIN KENDALL, b. 23 Jul 1818, Gardner MA; d. 19 Nov 1821, Gardner MA. 6. MIRIAM7 KENDALL (BENJAMIN6, BENJAMIN5, THOMAS4, THOMAS3, FRANCIS MILES2, JOHN1) was born 12 Mar 1784 in Gardner MA, and died Aft. 1820. She married BARTLETT STODDARD 13 Feb 1811 in Boston MA, son of LABAN STODDER and CELIA SPRAGUE. He was born 14 Aug 1784 in Hingham MA, and died Dec 1849 in Lowell MA. 27. i. BARTLETT8 STODDARD, b. 22 Jun 1817, Gardner MA; d. 10 Jun 1876, Scituate MA. ii. NANCY KEZIAH STODDARD, b. 03 Oct 1820, Gardner MA; d. 25 Nov 1820, Gardner MA. 7. BENJAMIN JOHN8 KENDALL (ASAPH7, BENJAMIN6, BENJAMIN5, THOMAS4, THOMAS3, FRANCIS MILES2, JOHN1) was born 29 May 1800 in Haverhill MA, and died 01 Apr 1881. He married BETSEY CLARK 24 May 1825 in Allenstown NH. She died Aft. 1828. 28. i. MARY E9 KENDALL, b. 04 Sep 1826, Fitchburg MA; d. 06 Jun 1906, Allenstown NH. 29. ii. BENJAMIN CLARK KENDALL, b. 26 Aug 1828, Fitchburg MA; d. 18 Jul 1915, Lancaster NH. iii. CHARLES WYMAN KENDALL, b. 20 Nov 1829, Fitchburg MA; d. Aft. 1850. 8. JAMES HENRY8 KENDALL (ASAPH7, BENJAMIN6, BENJAMIN5, THOMAS4, THOMAS3, FRANCIS MILES2, JOHN1) was born 23 Jun 1803 in Haverhill MA, and died 28 Apr 1877 in Berkley MA. He married MARY CHOATE 20 Jul 1828 in Gloucetser MA [7/19/1828 Ipswich MA]. She was born Abt. 1801 in MA, and died 25 Jan 1892 in Beverly MA. i. JAMES HENRY9 KENDALL, b. 06 Mar 1829, Ipswich MA; d. Aft. 1920; m. (1) MARTHA PICKETT, 22 Nov 1860, Danvers MA; b. Abt. 1835, MA; d. Bet. 1870 - 1900; m. (2) ANNIE DOYLE, 28 Jun 1915, Beverly MA; b. Nov 1845, Ireland; d. Aft. 1920. 9. ANN BETHIAH WHITMORE8 KENDALL (ASAPH7, BENJAMIN6, BENJAMIN5, THOMAS4, THOMAS3, FRANCIS MILES2, JOHN1) was born 03 Mar 1805 in Haverhill MA, and died 28 May 1895 in Beverly MA. She married (1) CHARLES CARY. She married (2) ROBERT CURRY 09 Aug 1858 in Beverly MA. He was born Abt. 1785 in MA, and died Aft. 1865.
i. ANN B9 CARY, b. 02 Dec 1829, Beverly MA. ii. FRANCIS E CARY, b. Mar 1830, Beverly MA. 10. DANIEL BRACKETT8 KENDALL (ASAPH7, BENJAMIN6, BENJAMIN5, THOMAS4, THOMAS3, FRANCIS MILES2, JOHN1) was born 11 May 1808 in Haverhill MA [5/12/1808 Danvers MA], and died 1889 in Retreat WI. He married LUCY GAGE BRAY 16 Jun 1831 in Gloucester MA [5/28/1831 Ipswich MA]. She was born 1810 in ME/Gloucester MA, and died 1886 in Retreat WI. i. HENRY PRENTISS9 KENDALL, b. 01 Feb 1832, Portland ME/Danvers MA; d. Aft. 1872; m. ELIZABETH WHITE, 28 Mar 1872, Sterling WI. ii. JOHN EMERY ABBOTT KENDALL, b. 19 Oct 1833, Danvers MA; d. 12 Dec 1841, Salem MA. 30. iii. LUCY GAGE KENDALL, b. 04 Apr 1836, Danvers MA; d. 20 Feb 1895, Peabody MA. iv. MARY ANN KENDALL, b. 01 Feb 1840, Danvers MA; d. 18 Dec 1840, Salem MA. v. EUNICE ANN KENDALL, b. 03 Mar 1842, Danvers MA; d. Aft. 1855.
vi. DANIEL BRICKETT KENDALL, b. 23 Oct 1844, Danvers MA; d. 25 Aug 1846, Danvers MA. 31. vii. WILLIAM BODEN KENDALL, b. 09 Aug 1846, Danvers MA; d. 22 Jul 1913, Paterson NJ. 32. viii. MARY IRVING KENDALL, b. 01 Feb 1851, Danvers MA; d. Bet. 1881 - 1900. 11. HUBBARD8 KENDALL (JONATHAN7, BENJAMIN6, BENJAMIN5, THOMAS4, THOMAS3, FRANCIS MILES2, JOHN1) was born 18 Apr 1796 in Gardner MA, and died 07 Feb 1855 in Gardner MA. He married RHODA BROOKS SAWIN 17 Jun 1819 in Westminster MA, daughter of JOSEPH SAWIN and MARY GILBERT. She was born 26 Mar 1797 in Westminster MA, and died 15 Nov 1883 in Gardner MA. 33. i. NANCY C9 KENDALL, b. Abt. 1820, Middlebury VT; d. 21 Mar 1882, Hubbardston MA. 34. ii. MARY G KENDALL, b. May 1824, VT; d. Aft. 1900.
iii. SALLY M KENDALL, b. Abt. 1826, Middlebury VT; d. 23 Feb 1863, Gardner MA. 35. iv. ALBERT A KENDALL, b. 03 Mar 1828, VT; d. 07 Sep 1862, Antietam. 36. v. EDWIN L KENDALL, b. 04 Oct 1832, Gardner MA; d. 29 Dec 1893, Gardner MA. 37. vi. EDWARD A KENDALL, b. 04 Oct 1832, Gardner MA; d. 17 Jun 1909, Gardner MA. 38. vii. ABIGAIL S KENDALL, b. 12 Nov 1834, Gardner MA; d. 04 Feb 1901, Gardner MA. viii. RHODA MARTHA A KENDALL, b. 07 Dec 1836, Gardner MA; d. 29 Nov 1877, Hubbardston MA; m. EARL D DANIELS, 19 Jun 1872, Gardner MA; b. Abt. 1812, VT; d. Aft. 1880. 39. ix. HARRIET ELLEN KENDALL, b. 22 Feb 1839, Gardner MA; d. 29 May 1860, Gardner MA. 12. EUNICE8 KENDALL (JONATHAN7, BENJAMIN6, BENJAMIN5, THOMAS4, THOMAS3, FRANCIS MILES2, JOHN1) was born 17 Oct 1800 in Hubbardston MA, and died 27 Mar 1873 in Gardner MA. She married LAFAYETTE COLEMAN 21 Aug 1821 in Hubbardston MA [int 7/14/1821 Templeton MA], son of JOHN COLMAN and JOANNA METCALF. He was born 06 Jun 1796 in Templeton MA, and died 02 Oct 1871 in Gardner MA. 40. i. HARRISON9 COLEMAN, b. Abt. 1822, Hubbardston MA; d. 14 Jan 1901, Gardner MA. 41. ii. LAFAYETTE COLEMAN, b. Abt. 1823, Hubbardston MA; d. 23 Dec 1891, Gardner MA. iii. SON COLEMAN, b. 08 Feb 1823, Hubbardston MA; d. 08 Feb 1823, Hubbardston MA. iv. SON COLEMAN, b. 12 Oct 1825, Hubbardston MA; d. 12 Oct 1825, Hubbardston MA. 42. v. AMOS COLEMAN, b. 12 Nov 1825, Hubbardston MA; d. 23 Feb 1904, Gardner MA. vi. DAUGHTER COLEMAN, b. 19 Aug 1827, Hubbardston MA; d. 19 Aug 1827, Hubbardston MA. 43. vii. FREDERICK A COLEMAN, b. 22 Mar 1829, Hubbardston MA; d. 05 Dec 1893, Gardner MA. viii. SON COLEMAN, b. 22 Mar 1829, Hubbardston MA; d. 22 Mar 1829, Hubbardston MA. ix. DAUGHTER COLEMAN, b. Abt. 1831; d. 27 Aug 1831, Hubbardston MA. 44. x. EUNICE JANE COLEMAN, b. 27 Aug 1831, Hubbardston MA; d. 12 Dec 1912, Gardner MA. xi. ORRISON COLEMAN, b. 25 Feb 1834, Gardner MA; d. 26 Jul 1854, Gardner MA. 45. xii. MELVIN COLEMAN, b. 17 Apr 1839, Gardner MA; d. 30 Mar 1901, Gardner MA. 13. EDMUND8 KENDALL (JONATHAN7, BENJAMIN6, BENJAMIN5, THOMAS4, THOMAS3, FRANCIS MILES2, JOHN1) was born 18 Apr 1805 in Hubbardston MA, and died 18 Jun 1848 in Gardner MA. He married MARY BENNETT 18 Nov 1838 in Hubbardston MA [int 9/21/1838 Gardner MA], daughter of WILLIAM BENNETT and CATY FOLLET. She was born 21 Jun 1814 in Hubbardston MA, and died 16 Jun 1897 in Gardner MA. i. CHESTER9 KENDALL, b. 11 Sep 1840, Gardner MA; d. 24 Oct 1842, Gardner MA. 14. REBECCA8 KENDALL (JONATHAN7, BENJAMIN6, BENJAMIN5, THOMAS4, THOMAS3, FRANCIS MILES2, JOHN1) was born 24 Feb 1810 in Hubbardston MA, and died 06 Aug 1889 in Winchendon MA. She married DAVID N BISHOP 13 Dec 1835 in Hubbardston MA. He was born Abt. 1812 in Warwick MA, and died 22 Oct 1874 in Westminster MA. 46. i. ELECTA9 BISHOP, b. 27 Oct 1836, Hubbardston MA; d. 01 Mar 1870, Westminster MA. 47. ii. ANSEL BISHOP, b. 05 Jan 1842, Hubbardston MA; d. 10 Feb 1919, Keene NH. 48. iii. SAMUEL BISHOP, b. 31 Dec 1843, Hubbardston MA; d. 16 Mar 1908, Winchendon MA. 49. iv. ELIZA JANE BISHOP, b. 06 Oct 1846, Hubbardston MA; d. 02 May 1868, Royalston MA. 15. MARY8 KENDALL (JONATHAN7, BENJAMIN6, BENJAMIN5, THOMAS4, THOMAS3, FRANCIS MILES2, JOHN1) was born 12 Feb 1812 in Hubbardston MA, and died 14 Mar 1856 in Warwick MA. She married SYLVESTER WEEKS JILLSON 17 Oct 1837 in Richmond NH, son of PAUL JILLSON and ZILPHIA SWEET. He was born 07 Apr 1813 in Richmond NH, and died 21 May 1884 in Warwick MA. 50. i. JUSTUS KENDALL9 JILLSON, b. 17 Nov 1839, Gardner MA; d. 09 Dec 1881, Springfield MA. ii. HENRY HARRISON JILLSON, b. 06 Nov 1841, Gardner MA; d. Aft. 1910; m. JANETTE E BALL, 21 Aug 1872, Warwick MA; b. Abt. 1851, MA; d. Aft. 1910.
iii. LEANDER SYLVESTER JILLSON, b. 17 Mar 1844, Gardner MA; d. 24 Feb 1862, Roanoke Island NC. iv. EMELINE ROSETTE JILLSON, b. 24 Oct 1853, Warwick MA; d. Aft. 1865. 16. FANNY8 KENDALL (JONATHAN7, BENJAMIN6, BENJAMIN5, THOMAS4, THOMAS3, FRANCIS MILES2, JOHN1) was born 03 Apr 1814 in Hubbardston MA, and died 03 Oct 1849 in Gardner MA. She married HARRISON HOWE 15 Jun 1842 in MA, son of BENJAMIN HOWE and KEZIAH HILL. He was born 05 Oct 1818 in Gardner MA, and died 01 Mar 1891 in Gardner MA. i. JAMES HARRISON9 HOWE, b. 12 Mar 1844, Gardner MA; d. 03 Apr 1886, Gardner MA; m. MARIA W CARRAVALL, 23 Feb 1872, Boston MA. 51. ii. LUCY F HOWE, b. 07 Sep 1845, Gardner MA; d. 09 Sep 1912, Gardner MA. 52. iii. SUMNER HOWE, b. 22 Jul 1847, Gardner MA; d. Aft. 1920. 17. REBECCA8 DUNSTER (REBECCA7 KENDALL, BENJAMIN6, BENJAMIN5, THOMAS4, THOMAS3, FRANCIS MILES2, JOHN1) was born 11 Feb 1802 in Gardner MA, and died Bet. 1850 - 1855. She married GILMAN ROBBINS 08 Mar 1827 in Gardner MA. He was born Abt. 1798 in Leominster MA, and died 29 Nov 1877 in Leominster MA. 53. i. GEORGE9 ROBBINS, b. 06 Dec 1827, Leominster MA; d. 22 Jun 1892, MA. 54. ii. CHARLES ROBBINS, b. 09 May 1830, Leominster MA; d. 14 Aug 1897, Somerville MA. iii. SARAH BROWN ROBBINS, b. 08 Jun 1832, Leominster MA; d. 12 Dec 1904, Somerville MA; m. MARTIN HATCH, 05 Oct 1875, Pembroke MA - later divorced; b. Abt. 15 Jun 1834, Pembroke MA; d. 20 Nov 1908, Boston MA. iv. JOSEPH ROBBINS, b. 12 Sep 1834, Leominster MA; d. Aft. 1850. 55. v. CAROLINE AUGUSTA ROBBINS, b. 16 Feb 1840, Leominster MA; d. 04 Dec 1892, Fitchburg MA. 56. vi. JEROME AUGUSTINE ROBBINS, b. 13 Nov 1844, Leominster MA; d. 24 Aug 1900, Somerville MA. 18. ASAPH8 DUNSTER (REBECCA7 KENDALL, BENJAMIN6, BENJAMIN5, THOMAS4, THOMAS3, FRANCIS MILES2, JOHN1) was born 06 Jul 1807 in Gardner MA, and died Aft. 1860. He married SARAH B STODDARD 02 Jan 1834 in Boston MA. She was born Abt. 1807 in MA, and died Aft. 1870.
i. LYDIA A9 DUNSTER, b. Abt. 1835, MA; d. Aft. 1860. 57. ii. SARAH C DUNSTER, b. 12 Sep 1836, MA; d. 17 Sep 1916, Chicago IL. 58. iii. REBECCA HENRETTA DUNSTER, b. Aug 1839, Malden/Roseland MA; d. 03 Jul 1906, Chicago IL. iv. SON DUNSTER, b. 23 Sep 1843, Malden MA. v. LUCY FRANCES DUNSTER, b. 16 Dec 1846, Malden MA; d. Aft. 1850. 19. LYDIA8 DUNSTER (REBECCA7 KENDALL, BENJAMIN6, BENJAMIN5, THOMAS4, THOMAS3, FRANCIS MILES2, JOHN1) was born 24 Jan 1816 in Gardner MA, and died 05 Apr 1863 in Gardner MA. She married JOEL NICHOLS 09 Oct 1836 in Gardner MA, son of EDMOND NICHOLS and DORCAS WHITNEY. He was born 22 Oct 1809 in Westminster MA, and died 25 Nov 1897 in Gardner MA. i. ELIZA A9 NICHOLS, b. 26 Sep 1842, Gardner MA; d. 20 Aug 1867, Boston MA; m. JOSEPH FRANCIS HEYWOOD, 08 Aug 1862, Fitchburg/Gardner MA; b. 19 Oct 1837, Gardner MA; d. 02 Apr 1884, Somerville MA. 59. ii. FRANK EDMUND NICHOLS, b. 27 Apr 1848, Gardner MA; d. Aft. 1910. 60. iii. EMMA PARSONS NICHOLS, b. 28 Aug 1850, Gardner MA; d. 19 Mar 1903, Somerville MA. 20. DAPHENY LELAND8 DUNSTER (REBECCA7 KENDALL, BENJAMIN6, BENJAMIN5, THOMAS4, THOMAS3, FRANCIS MILES2, JOHN1) was born 18 Jul 1818 in Gardner MA, and died 21 Mar 1891 in Maeser UT. She married JOHN PARSON(S) 19 Sep 1849. He was born 26 Feb 1816 in IN, and died 12 Jan 1881 in Browns Park UT. 61. i. WARREN DEROUSSE9 PARSON, b. Feb 1851, Quincy IL; d. Aft. 1910.
ii. CHARLES PARSONS, b. Abt. 1853, Quincy IL. 62. iii. HELENA EMMA PARSONS, b. 17 May 1861, Leadville CO; d. 19 Jan 1913, Pinedale WY. 21. ISAAC P8 KENDALL (MARTIN7, BENJAMIN6, BENJAMIN5, THOMAS4, THOMAS3, FRANCIS MILES2, JOHN1) was born 06 Sep 1801 in Gardner MA, and died 11 Dec 1883 in Gardner MA. He married CAROLINE PARTRIDGE 15 Mar 1829 in [4/15/1830] Gardner MA, daughter of ADAM PARTRIDGE and POLLY JACKSON. She was born 13 Nov 1808 in Gardner MA, and died 15 Mar 1900 in Gardner MA. 63. i. SOLON9 KENDALL, b. Abt. 1831, MA; d. Aft. 1880.
ii. CAROLINE KENDALL, b. Abt. 1832, MA; d. Aft. 1850.
iii. LOUISA KENDALL, b. Abt. 1836, VT; d. Aft. 1850.
iv. MARCUS KENDALL, b. Abt. 1842, VT; d. Aft. 1870.
v. HARRIET KENDALL, b. 1844, VT; d. 1931. 22. MARY8 KENDALL (MARTIN7, BENJAMIN6, BENJAMIN5, THOMAS4, THOMAS3, FRANCIS MILES2, JOHN1) was born 08 Sep 1803 in Gardner MA, and died 04 Apr 1875 in Templeton MA. She married ASA PERLEY 21 Oct 1821 in Gardner MA, son of ALLEN PERLEY and LYDIA PROCTOR. He was born 04 Oct 1797 in Gardner MA, and died 03 Sep 1867 in Templeton MA. 64. i. MARY ELMIRA9 PERLEY, b. 05 May 1822, Gardner MA; d. 15 Jan 1900, Baldwinville MA. 65. ii. ASA PROCTOR PERLEY, b. 04 Jun 1824, Gardner MA; d. 26 Apr 1886, Gardner MA. 66. iii. CHARLES ADDISON PERLEY, b. 15 Sep 1826, Gardner MA; d. 02 Feb 1887, Templeton MA. iv. WILLIAM PORTER PERLEY, b. 02 Apr 1829, Gardner MA; d. Aft. 1880; m. MARTHA JANE WRIGHT, 29 Nov 1860, Templeton MA; b. Abt. 1839, Templeton MA; d. 06 Dec 1872, Templeton MA. 67. v. GEORGE ALLEN PERLEY, b. 08 Jul 1831, Gardner MA; d. 14 May 1896, Gardner MA. 68. vi. JAMES MONROE PERLEY, b. 26 Feb 1834, Gardner MA; d. 05 Jun 1907, Baldwinville MA. 69. vii. FRANCIS WALTER PERLEY, b. 04 May 1836, Gardner MA; d. Aft. 1900. 70. viii. THEOPHILUS PARSONS PERLEY, b. 12 Nov 1838, Gardner MA; d. 03 Dec 1901, Gardner MA. ix. LEANDER ALONZO PERLEY, b. 19 Jun 1841, Gardner MA; d. Aft. 1860. 71. x. LEWIS S PERLEY, b. 17 Jun 1844, Gardner MA; d. 31 May 1912, Baldwinville MA. xi. ELLEN MARIA PERLEY, b. 10 Sep 1846, Gardner MA; d. Aft. 1860. 23. ANNIS8 KENDALL (MARTIN7, BENJAMIN6, BENJAMIN5, THOMAS4, THOMAS3, FRANCIS MILES2, JOHN1) was born 18 Dec 1807 in Gardner MA, and died 23 Apr 1863 in Gardner MA. She married ROBERT POWERS 05 Nov 1829 in Gardner MA, son of ROBERT POWERS and MARY POWERS. He was born 1803 in Oakham MA, and died 16 Mar 1875 in VT.
72. i. FREDERICK WILLIAM9 POWERS, b. 03 Dec 1830, Gardner MA; d. Bet. 1866 - 1870.
ii. MARY STODDARD POWERS, b. 30 Jan 1832, Gardner MA; d. 26 Oct 1843, Gardner MA. 73. iii. ADALINE KENDALL POWERS, b. 12 Apr 1834, Gardner MA; d. 24 Dec 1894, Gardner MA. iv. MARTIN KENDALL POWERS, b. 01 Feb 1837, Gardner MA; d. 1926; m. HARRIET DAY, 20 Sep 1859, Gardner MA; b. 23 Sep 1837, Templeton MA; d. 28 Jan 1906, Worcester MA. 74. v. PRUDENCE ELIZABETH POWERS, b. 16 May 1840, Gardner MA; d. Aft. 1930. 75. vi. LORENZO JONES POWERS, b. Feb 1843, Gardner MA; d. Aft. 1910. 76. vii. AMOS PROCTOR POWERS, b. Nov 1845, MA; d. Aft. 1920. 77. viii. HENRY AUGUSTUS POWERS, b. 13 May 1848, Gardner MA; d. Aft. 1920. 24. DAVID8 KENDALL (MARTIN7, BENJAMIN6, BENJAMIN5, THOMAS4, THOMAS3, FRANCIS MILES2, JOHN1) was born 27 Feb 1810 in Gardner MA, and died 05 Feb 1898 in Gardner MA. He married LUCY KEMP 24 Oct 1835 in Gardner MA, daughter of JOHN KEMP and SARAH SHATTUCK. She was born 26 Jan 1816 in Gardner MA, and died 21 Dec 1910 in Gardner MA. 78. i. ELIZA ANN9 KENDALL, b. 09 May 1837, Gardner MA; d. 1916. 79. ii. GEORGE KENDALL, b. 01 Mar 1839, Gardner MA; d. 1922.
iii. WEBSTER AUGUSTUS KENDALL, b. 05 Mar 1841, Gardner MA; d. 30 Apr 1896, Gardner MA; m. (1) ADELINE MARIA NUTTING, 05 Dec 1865, Keene NH; b. 01 Feb 1839, Jaffrey NH; d. 25 Apr 1867, Gardner MA; m. (2) CAROLINE A PARMALEE, 13 Jul 1876, Boston MA; b. Abt. 1843, NH; d. 30 Jan 1890, Gardner MA. 80. iv. ELLEN J KENDALL, b. 28 Apr 1843, Gardner MA; d. 03 Nov 1875, Gardner MA. v. MARY JANE KENDALL, b. 02 Sep 1845, Gardner MA; d. 13 Jan 1847, Gardner MA. 81. vi. FRANCENA MARIA KENDALL, b. 09 Jan 1848, Gardner MA; d. 1935.
vii. MARY J KENDALL, b. 14 Mar 1850, Gardner MA; d. 09 Oct 1853, Gardner MA. viii. ALICE ISABELL KENDALL, b. 30 Mar 1852, Gardner MA; d. 06 Dec 1852, Gardner MA. 82. ix. CHARLES OTIS KENDALL, b. 21 Dec 1853, Gardner MA; d. 09 Jan 1902, Gardner MA. 83. x. FRANK H KENDALL, b. Mar 1855, MA; d. Aft. 1920. 84. xi. FLORA A KENDALL, b. 07 Dec 1861, Gardner MA; d. 30 Apr 1880, Gardner MA. 25. BARTLETT STODDARD8 KENDALL (MARTIN7, BENJAMIN6, BENJAMIN5, THOMAS4, THOMAS3, FRANCIS MILES2, JOHN1) was born 25 Mar 1814 in Gardner MA, and died 16 Jan 1881 in VT. He married MARTHA HOW HINDS 19 Jan 1840 in Gardner MA, daughter of ABIJAH HINDS and SUSANNAH COLEMAN. She was born 07 Jun 1817 in Gardner MA, and died Aft. 1880.
i. EDWARD I9 KENDALL, b. Jan 1851, Jamaica VT; d. Aft. 1900; m. (1) ADDIE O BURBANK, 20 Oct 1873, VT; m. (2) MINNIE M BURBEE, 13 Sep 1893, VT; d. Aft. 1900.
ii. CHARLES B KENDALL, b. 07 Nov 1857, Winhall VT; d. Aft. 1870. 26. BENJAMIN F8 KENDALL (MARTIN7, BENJAMIN6, BENJAMIN5, THOMAS4, THOMAS3, FRANCIS MILES2, JOHN1) was born 30 Jun 1816 in Gardner MA, and died 01 Jan 1892 in Gardner MA. He married MARY BENNETT 07 Oct 1850 in Gardner MA, daughter of WILLIAM BENNETT and CATY FOLLET. She was born 21 Jun 1814 in Hubbardston MA, and died 16 Jun 1897 in Gardner MA. i. ERWIN9 KENDALL, b. 17 Oct 1852, Gardner MA; d. 21 Oct 1893, Westfield MA. ii. WILLIE KENDALL, b. 07 Apr 1856, Gardner MA; d. 16 Jul 1856, Gardner MA. iii. RUFUS KENDALL, b. 02 May 1857, Gardner MA; d. 1924; m. ANNIE QUIGLEY, 06 Sep 1882, Fitchburg MA; b. Abt. 1856, Canada; d. 1929. 27. BARTLETT8 STODDARD (MIRIAM7 KENDALL, BENJAMIN6, BENJAMIN5, THOMAS4, THOMAS3, FRANCIS MILES2, JOHN1) was born 22 Jun 1817 in Gardner MA, and died 10 Jun 1876 in Scituate MA. He married MARY JANE CURTIS(?). She was born Abt. 1823 in MA, and died Aft. 1870. 85. i. MARY ELLEN (HELEN)9 STODDARD, b. 14 Jul 1847, Lowell MA; d. Aft. 1920. 28. MARY E9 KENDALL (BENJAMIN JOHN8, ASAPH7, BENJAMIN6, BENJAMIN5, THOMAS4, THOMAS3, FRANCIS MILES2, JOHN1) was born 04 Sep 1826 in Fitchburg MA, and died 06 Jun 1906 in Allenstown NH. She married AUGUSTUS O EVANS. He was born Abt. 1831 in NH, and died Bef. 1880.
i. CHARLES R10 EVANS, b. Abt. 1859, MA; d. Aft. 1880. 29. BENJAMIN CLARK9 KENDALL (BENJAMIN JOHN8, ASAPH7, BENJAMIN6, BENJAMIN5, THOMAS4, THOMAS3, FRANCIS MILES2, JOHN1) was born 26 Aug 1828 in Fitchburg MA, and died 18 Jul 1915 in Lancaster NH. He married ANN ELIZABETH MCKEAN Abt. 1858. She was born Oct 1828 in NH, and died 08 Jul 1904 in NH. i. JOHN M10 KENDALL, b. Oct 1860, Manchester NH; d. 14 Nov 1937, NH; m. EUNICE E TRENHOLM, 10 Aug 1885, Manchester NH; b. Apr 1861, Canada; d. Aft. 1920.
ii. CHARLES BENJAMIN KENDALL, b. 18 Mar 1865, Manchester NH; d. 12 Apr 1935, Warwick RI. 30. LUCY GAGE9 KENDALL (DANIEL BRACKETT8, ASAPH7, BENJAMIN6, BENJAMIN5, THOMAS4, THOMAS3, FRANCIS MILES2, JOHN1) was born 04 Apr 1836 in Danvers MA, and died 20 Feb 1895 in Peabody MA. She married GEORGE C PIERCE 21 Jan 1862 in Ipswich MA. He was born Abt. 1820 in MA, and died Aft. 1880.
i. ALBERT10 PIERCE, b. 19 Apr 1868, Peabody MA. ii. FANNIE THERESE PIERCE, b. 28 Apr 1869, Peabody MA; d. Aft. 1880. 31. WILLIAM BODEN9 KENDALL (DANIEL BRACKETT8, ASAPH7, BENJAMIN6, BENJAMIN5, THOMAS4, THOMAS3, FRANCIS MILES2, JOHN1) was born 09 Aug 1846 in Danvers MA, and died 22 Jul 1913 in Paterson NJ. He married GORDON SHAW 26 Nov 1874 in Wheatland WI. She was born 17 May 1858 in Paterson NJ, and died 01 Feb 1930 in Paterson NJ. i. BESSE S10 KENDALL, b. Abt. 1876, IA; d. 02 Jun 1891, Passaic NJ. ii. DARNEL KENDALL, b. Abt. 1877, IA; d. 09 Jul 1892, Paterson NJ. 86. iii. LUCY G KENDALL, b. Jun 1879, WI; d. Aft. 1920.
iv. WILLIAM BODEN KENDALL, b. Apr 1881, Dakota; d. 1920, Paterson NJ; m. CHRISTINE ? ; b. Abt. 1879; d. Aft. 1905.
v. CHARLES KENDALL, b. 1890, Paterson NJ; d. 11 Apr 1891, Paterson NJ. 32. MARY IRVING9 KENDALL (DANIEL BRACKETT8, ASAPH7, BENJAMIN6, BENJAMIN5, THOMAS4, THOMAS3, FRANCIS MILES2, JOHN1) was born 01 Feb 1851 in Danvers MA, and died Bet. 1881 - 1900. She married BENJAMIN FRANKLIN KENT 01 Jan 1872 in Wheatland WI. He was born 24 Jul 1835 in Danvers MA, and died 01 Mar 1911 in Eugene OR. i. CHARLES F10 KENT, b. 1872, WI; d. 1898, Eugene OR. ii. MARY EMMA KENT, b. May 1881, IA; d. 1957, Eugene OR. 33. NANCY C9 KENDALL (HUBBARD8, JONATHAN7, BENJAMIN6, BENJAMIN5, THOMAS4, THOMAS3, FRANCIS MILES2, JOHN1) was born Abt. 1820 in Middlebury VT, and died 21 Mar 1882 in Hubbardston MA. She married QUINCY BAKER 12 Dec 1855 in Hubbardston MA, son of ARTEMAS BAKER and SARAH NICHOLS. He was born 08 May 1808 in Hubbardston MA, and died 09 Jan 1877 in Hubbardston MA. i. CHARLES H10 BAKER, b. 15 Aug 1857, Hubbardston MA; d. Aft. 1910. 34. MARY G9 KENDALL (HUBBARD8, JONATHAN7, BENJAMIN6, BENJAMIN5, THOMAS4, THOMAS3, FRANCIS MILES2, JOHN1) was born May 1824 in VT, and died Aft. 1900. She married GEORGE L RAWSON 11 Jun 1846 in Gardner MA, son of LOVELL RAWSON and MARTHA ?. He was born Abt. 1825 in of Jamaica Vt, and died Bet. 1880 - 1900.
i. HELENA CAROLINA10 RAWSON, b. 26 Jan 1848, Worcester MA; d. Aft. 1930; m. ? HENSLEY (HEMSLEY), Abt. 1899, Divorced bef 1900.
ii. HERBERT L RAWSON, b. 30 Mar 1856, MA; d. 11 Sep 1944, Los Angeles CA; m. ? ?, Aft 1900; d. Bef. 1920. 35. ALBERT A9 KENDALL (HUBBARD8, JONATHAN7, BENJAMIN6, BENJAMIN5, THOMAS4, THOMAS3, FRANCIS MILES2, JOHN1) was born 03 Mar 1828 in VT, and died 07 Sep 1862 in Antietam. He married HELEN MARIA BIGELOW 15 Feb 1854 in New Braintee MA, daughter of AMASA BIGELOW and HANNAH LEE. She was born 19 Sep 1834 in New Braintree MA, and died Aft. 1920.
i. HENRY HUBBARD10 KENDALL, b. 11 Mar 1855, New Braintree MA; d. Aft. 1855; m. ANNE B STEARNS. ii. FREDERICK ALBERT KENDALL, b. 01 Jun 1860, MA; d. Aft. 1920. 36. EDWIN L9 KENDALL (HUBBARD8, JONATHAN7, BENJAMIN6, BENJAMIN5, THOMAS4, THOMAS3, FRANCIS MILES2, JOHN1) was born 04 Oct 1832 in Gardner MA, and died 29 Dec 1893 in Gardner MA. He married ADALINE KENDALL POWERS 15 May 1855 in Gardner MA, daughter of ROBERT POWERS and ANNIS KENDALL. She was born 12 Apr 1834 in Gardner MA, and died 24 Dec 1894 in Gardner MA. 87. i. ARTHUR LIONEL10 KENDALL, b. 20 Aug 1857, Gardner MA; d. 1937. 88. ii. ALBERT EDWARD KENDALL, b. 10 Nov 1862, MA; d. 1933.
iii. ISABEL KENDALL, b. 14 Feb 1864, Gardner MA; d. Aft. 1930. 89. iv. HELEN KENDALL, b. 09 Sep 1870, Gardner MA; d. Aft. 1940. 37. EDWARD A9 KENDALL (HUBBARD8, JONATHAN7, BENJAMIN6, BENJAMIN5, THOMAS4, THOMAS3, FRANCIS MILES2, JOHN1) was born 04 Oct 1832 in Gardner MA, and died 17 Jun 1909 in Gardner MA. He married (1) MARY GILBERT SAWIN 16 May 1854 in Gardner MA, daughter of LUKE SAWIN and CLARISSA LANE. She was born 14 May 1833 in Gardner MA, and died 12 Jul 1855 in Gardner MA. He married (2) OLIVE JANE VAILE 06 Nov 1856 in Londonderry VT, daughter of ZETHAN VAILE and SARAH WILLIAMS. She was born 26 Apr 1835 in Winhall VT, and died 30 Jan 1900 in Gardner MA. i. CLARA10 KENDALL, b. 27 Mar 1855, Gardner MA; d. Bef. 1865. 90. ii. WILLIAM HUBBARD10 KENDALL, b. 17 Oct 1857, Jamaica VT; d. 11 Feb 1908, Gardner MA. iii. MARY JANE KENDALL, b. 18 Mar 1860, Jamaica VT; d. 1929; m. WILLIE HOBART KENDALL, 25 Oct 1881, Gardner MA; b. 28 Jan 1860, Gardner MA; d. 1938.
iv. ETHEL MAUD KENDALL, b. 16 Jan 1878, Gardner MA; d. Aft. 1898; m. JOHN THOMAS MORRISSY, 04 Mar 1898, (3/4/1897) Gardner MA; b. 27 Dec 1868, Hubbardston MA; d. Aft. 1898. 38. ABIGAIL S9 KENDALL (HUBBARD8, JONATHAN7, BENJAMIN6, BENJAMIN5, THOMAS4, THOMAS3, FRANCIS MILES2, JOHN1) was born 12 Nov 1834 in Gardner MA, and died 04 Feb 1901 in Gardner MA. She married DENZILL D JILLSON 29 Apr 1855 in Worcester MA, son of PAUL JILLSON and ZILPHIA SWEET. He was born 1830 in Richmond NH, and died 29 Sep 1898 in Gardner MA. 91. i. LILLIAN MELISSA10 JILLSON, b. Jun 1856, MA; d. Aft. 1930. 92. ii. ALICE HARRIET JILLSON, b. 29 Apr 1861, Gardner MA; d. 10 Apr 1902, Gardner MA. 93. iii. GEORGE WASHINGTON JILLSON, b. 11 Jul 1869, Fitchburg MA; d. Aft. 1940. 39. HARRIET ELLEN9 KENDALL (HUBBARD8, JONATHAN7, BENJAMIN6, BENJAMIN5, THOMAS4, THOMAS3, FRANCIS MILES2, JOHN1) was born 22 Feb 1839 in Gardner MA, and died 29 May 1860 in Gardner MA. She married DANIEL WOODS MCFARLAND 23 Feb 1856 in Gardner MA, son of ELIJAH MCFARLAND and ACHSAH WOODS. He was born 17 Mar 1834 in Hubbardston MA, and died 08 Apr 1901 in Bridgewater MA. 94. i. ALVAH F10 MCFARLAND, b. Nov 1857, MA; d. Bet. 1920 - 1930. 95. ii. MINNIE MCFARLAND, b. 06 Oct 1858, Gardner MA; d. Bet. 1910 - 1940. 40. HARRISON9 COLEMAN (EUNICE8 KENDALL, JONATHAN7, BENJAMIN6, BENJAMIN5, THOMAS4, THOMAS3, FRANCIS MILES2, JOHN1) was born Abt. 1822 in Hubbardston MA, and died 14 Jan 1901 in Gardner MA. He married AUGUSTA ?. She was born Abt. 1827 in VT, and died Aft. 1880.
i. IDA A10 COLEMAN, b. Nov 1851, NY; d. 24 Feb 1903, VT; m. WILLIAM H BENNETT, 08 Jun 1897, VT; b. Feb 1835, VT; d. Aft. 1900. 41. LAFAYETTE9 COLEMAN (EUNICE8 KENDALL, JONATHAN7, BENJAMIN6, BENJAMIN5, THOMAS4, THOMAS3, FRANCIS MILES2, JOHN1) was born Abt. 1823 in Hubbardston MA, and died 23 Dec 1891 in Gardner MA. He married EUNICE GREEN 19 Apr 1849 in Hubbardston MA, daughter of JOSEPH GREEN and SALLY FOSTER. She was born 10 Nov 1825 in Hubbardston MA, and died 04 Mar 1916 in Gardner MA. 96. i. SARAH AUGUSTA10 COLEMAN, b. 13 Jul 1851, Hubbardston MA; d. 03 Apr 1899, Gardner MA. ii. EMMA JANE COLEMAN, b. 26 Jul 1853, Gardner MA; d. Bef. 1855.
iii. EMMA JANE COLEMAN, b. 24 Apr 1856, Gardner MA; d. 28 Feb 1874, Gardner MA. iv. ESTELLA MELISSA COLEMAN, b. 26 Jun 1858, Gardner MA; d. 19 Mar 1911, Gardner MA; m. WILLIE ORLESTUS ADAMS, 25 Oct 1877, Gardner MA; b. 15 Jun 1853, Gardner MA; d. 1933. 97. v. GEORGE MELDAN COLEMAN, b. 07 Oct 1861, Gardner MA; d. Aft. 1930. 98. vi. HENRY JILLSON COLEMAN, b. 23 May 1866, Gardner MA; d. Aft. 1930. 42. AMOS9 COLEMAN (EUNICE8 KENDALL, JONATHAN7, BENJAMIN6, BENJAMIN5, THOMAS4, THOMAS3, FRANCIS MILES2, JOHN1) was born 12 Nov 1825 in Hubbardston MA, and died 23 Feb 1904 in Gardner MA. He married LUCRETIA TAYLOR 21 Sep 1858 in Holden MA, daughter of ADOLPHUS TAYLOR and LUCRETIA KNAPP. She was born Dec 1835 in NYC, and died 05 Jan 1905 in Gardner MA. i. LEONIDAS10 COLEMAN, b. 07 Sep 1861, Gardner MA; d. 11 Jan 1862, Gardner MA. ii. EVA MEDORA COLEMAN, b. 25 Oct 1865, Gardner MA; d. 1945; m. (1) ALVA WALKER HOLBROOK, 21 Nov 1883, Gardner MA - later divorced? ; b. 23 May 1861, Holden MA; d. 05 Feb 1907, Worcester MA; m. (2) WALTER A WILLIAMS, 11 Oct 1900, Westminster MA; b. Abt. 1855, Petersham MA; d. Aft. 1900. 43. FREDERICK A9 COLEMAN (EUNICE8 KENDALL, JONATHAN7, BENJAMIN6, BENJAMIN5, THOMAS4, THOMAS3, FRANCIS MILES2, JOHN1) was born 22 Mar 1829 in Hubbardston MA, and died 05 Dec 1893 in Gardner MA. He married EMELINE W BURGESS 26 Jul 1851 in Gardner MA, daughter of JONATHAN BURGESS and LOIS HANDY. She was born 25 Jul 1833 in Ashburnham MA, and died 04 Feb 1918 in Gardner MA. i. MARY REBECCA10 COLEMAN, b. 28 Sep 1852, Hubbardston/Boston MA; d. 03 Jan 1875, Gardner MA; m. JOSEPH DEXTER BOYNTON, 09 Jul 1872, Gardner MA; b. 23 Aug 1849, Ashburnham MA; d. 13 Jan 1895, Gardner MA. 99. ii. ORRISON EVERETT COLEMAN, b. 17 Jan 1855, Gardner MA; d. 16 Oct 1919, Gardner MA. iii. CHARLES F COLEMAN, b. 01 Apr 1864, Gardner MA; d. 23 Dec 1897, Gardner MA. 44. EUNICE JANE9 COLEMAN (EUNICE8 KENDALL, JONATHAN7, BENJAMIN6, BENJAMIN5, THOMAS4, THOMAS3, FRANCIS MILES2, JOHN1) was born 27 Aug 1831 in Hubbardston MA, and died 12 Dec 1912 in Gardner MA. She married BELLARMIN BOLTON in By 1852, son of EBENEZER BOLTON and LENDAY LELAND. He was born 10 Oct 1824 in Gardner MA, and died 07 Feb 1895 in Gardner MA. i. CHARLES EDMUND10 BOLTON, b. 24 Apr 1852, Gardner MA; d. 26 Jul 1855, Gardner MA. ii. CHARLES NELSON BOLTON, b. 07 Dec 1859, Gardner MA; d. 29 May 1863, Gardner MA. iii. HOBART LESURE BOLTON, b. 02 Nov 1866, Gardner MA; d. Aft. 1900. 45. MELVIN9 COLEMAN (EUNICE8 KENDALL, JONATHAN7, BENJAMIN6, BENJAMIN5, THOMAS4, THOMAS3, FRANCIS MILES2, JOHN1) was born 17 Apr 1839 in Gardner MA, and died 30 Mar 1901 in Gardner MA. He married ELLEN MARIA FOSKETT 25 Nov 1863 in Westminster MA, daughter of JOHN FOSKETT and CAROLINE PHILLIPS. She was born 02 May 1841 in Westminster MA, and died 28 Nov 1936 in Richmond Hill NY. i. HERBERT JOHN10 COLEMAN, b. 10 Feb 1865, Gardner MA; d. 11 Sep 1927, Winchendon MA; m. (1) MYRTENA BELL CARR; b. 17 Oct 1879, Boston MA; d. 27 Jan 1965, Gardner MA; m. (2) SARAH ANNA BROOKS, 20 May 1891, Gardner MA; b. 04 Apr 1866, Barre MA; d. 23 Dec 1912, Westminster MA; m. (3) GRACE GENEVA CARR, 14 Jan 1914, Dorchester MA; b. 14 Mar 1877, Boston MA; d. 27 Apr 1915. 100. ii. FANNY MABEL COLEMAN, b. 06 Feb 1871, Gardner MA; d. 24 Sep 1920, Philadelphia PA.
101. iii. EMMA PHILLIPS COLEMAN, b. 01 Jul 1876, Gardner MA; d. 16 Nov 1952, Richmond Hill NY. 46. ELECTA9 BISHOP (REBECCA8 KENDALL, JONATHAN7, BENJAMIN6, BENJAMIN5, THOMAS4, THOMAS3, FRANCIS MILES2, JOHN1) was born 27 Oct 1836 in Hubbardston MA, and died 01 Mar 1870 in Westminster MA. She married PRESTON PARTRIDGE ELLIS 12 May 1859 in Westminster MA, son of PRESTON ELLIS and SAMANTHA PATRIDGE. He was born 15 Dec 1831 in Bellingham MA, and died Aft. 1920.
i. WALTER ELLSWORTH10 ELLIS, b. 22 Jun 1862, Westminster MA; d. 12 Feb 1915, Pembroke MA. ii. HERVEY LINCOLN ELLIS, b. 01 Aug 1869, Westminster MA; d. Aft. 1914; m. HATTIE ELLA EMERSON, 30 Sep 1914, Somerville MA; b. Mar 1861, MA; d. Aft. 1914. 47. ANSEL9 BISHOP (REBECCA8 KENDALL, JONATHAN7, BENJAMIN6, BENJAMIN5, THOMAS4, THOMAS3, FRANCIS MILES2, JOHN1) was born 05 Jan 1842 in Hubbardston MA, and died 10 Feb 1919 in Keene NH. He married (1) ADDIE ANNETT SEAVER 30 May 1867 in Athol MA, daughter of ISAAC SEAVER and BETSEY PERRY. She was born 13 May 1849 in Westminster MA, and died 01 Aug 1869 in Gardner MA. He married (2) MATILDA BROMHER 18 Nov 1871 in Royalston MA. He married (3) ALMEDA B BLACK 25 Jun 1879 in Sterling MA. She was born Abt. 1849 in Chesterfield NH, and died 12 May 1881 in Westminster MA. He married (4) SARAH ABIGAIL STOCKWELL 23 Nov 1881 in Westminster MA - divorced?, daughter of GEORGE STOCKWELL and SABRA BOSWORTH. She was born 04 Apr 1854 in Royalston MA, and died Aft. 1910. 102. i. FRANK CHESTER10 BISHOP, b. 23 Apr 1868, Westminster MA; d. Aft. 1920.
ii. ALICE ELECTA10 BISHOP, b. 16 Jan 1880, Westminster MA; d. Aft. 1920; m. ALVIN KING, 16 Sep 1899, Athol MA; b. 30 Dec 1833, Orange MA; d. 19 Sep 1913, Orange MA. iii. WARREN LESTER10 BISHOP, b. 09 Apr 1883, Winchendon MA; d. Aft. 1930; m. MINNIE R ?, Abt. 1920; b. Abt. 1874, Canada; d. Aft. 1930.
iv. EFFIE BISHOP, b. Feb 1888, MA; d. Aft. 1910; m. ENVILLE VORCE, 23 Jan 1909, Winchendon MA; b. Abt. 1888, Canada; d. Aft. 1910. 48. SAMUEL9 BISHOP (REBECCA8 KENDALL, JONATHAN7, BENJAMIN6, BENJAMIN5, THOMAS4, THOMAS3, FRANCIS MILES2, JOHN1) was born 31 Dec 1843 in Hubbardston MA, and died 16 Mar 1908 in Winchendon MA. He married ELEANOR J BALLOU 12 Dec 1867 in NH - later divorced. She was born Jan 1851 in NH, and died Aft. 1920.
i. EUGENE R10 BISHOP, b. Dec 1868, NH; d. Aft. 1930; m. (1) JENNIE S BARRETT, 01 Jan 1894, Winchester NH - later divorced; b. Jan 1860, NH; d. Aft. 1900; m. (2) INDIA FLORENCE PERRY, 02 Jan 1909, Central Falls RI; b. Oct 1870, NH; d. Aft. 1930.
ii. JAMES R BISHOP, b. 26 Apr 1871, Swanzey NH; d. Aft. 1940; m. FLORENCE M ? ; b. Abt. 1882, NH; d. Aft. 1940.
iii. DAUGHTER BISHOP, b. 09 Nov 1872, Swanzey NH. iv. SON BISHOP, b. Abt. 1873, Swanzey NH; d. 24 Feb 1873, Swanzey NH. 103. v. FRED O BISHOP, b. 17 Aug 1875, Swanzey NH; d. 28 Jan 1904, Fitchburg MA. 104. vi. STELLA AGNEW BISHOP, b. 18 Mar 1881, Sawnzey NH; d. Aft. 1900. 49. ELIZA JANE9 BISHOP (REBECCA8 KENDALL, JONATHAN7, BENJAMIN6, BENJAMIN5, THOMAS4, THOMAS3, FRANCIS MILES2, JOHN1) was born 06 Oct 1846 in Hubbardston MA, and died 02 May 1868 in Royalston MA. She married DANIEL H GUNN 24 Sep 1865 in Westminster MA. He was born Abt. 1843 in VT, and died Aft. 1900.
i. ALICE ELECTA10 GUNN, b. 08 Aug 1867, Royalston MA; d. 22 Oct 1868, Royalston MA. 50. JUSTUS KENDALL9 JILLSON (MARY8 KENDALL, JONATHAN7, BENJAMIN6, BENJAMIN5, THOMAS4, THOMAS3, FRANCIS MILES2, JOHN1) was born 17 Nov 1839 in Gardner MA, and died 09 Dec 1881 in Springfield MA. He married ELLEN A GATES 21 Nov 1868 in Petersham MA, daughter of MOSES GATES and ANN ?. She was born 18 Nov 1839 in Barre MA, and died 29 Apr 1920 in Worcester MA. i. HERBERT L10 JILLSON, b. Sep 1870, Columbia SC; d. 20 Jun 1943, Concord NH; m. EVA A PARKER, 03 Jun 1896, Worcester MA - later divorced; b. Mar 1874, MA; d. Aft. 1920.
ii. ALLAN K JILLSON, b. Abt. 1875, Columbia SC; d. 10 Oct 1893, Worcester MA. 51. LUCY F9 HOWE (FANNY8 KENDALL, JONATHAN7, BENJAMIN6, BENJAMIN5, THOMAS4, THOMAS3, FRANCIS MILES2, JOHN1) was born 07 Sep 1845 in Gardner MA, and died 09 Sep 1912 in Gardner MA. She married (1) GEORGE W SWEET 31 Dec 1870 in Athol/Gardner MA, son of NEWTON SWEET and CLARISSA ?. He was born Abt. 1833 in Norton MA, and died 28 Dec 1875 in Gardner MA. She married (2) CHARLES O PLANTIER 07 Apr 1880 in Barre MA, son of CHARLES PLANTIER and EMELINE COUPAL. He was born Nov 1839 in Canada, and died 1926.
i. EDNA GERTRUDE10 PLANTIER, b. 16 Oct 1881, Gardner MA; d. 04 May 1882, Gardner MA. 105. ii. BELVA AGNES PLANTIER, b. 12 Jul 1884, Gardner MA; d. Jun 1964, MA. 106. iii. ALICE AMY PLANTIER, b. 20 May 1889, Gardner MA; d. 1961. 52. SUMNER9 HOWE (FANNY8 KENDALL, JONATHAN7, BENJAMIN6, BENJAMIN5, THOMAS4, THOMAS3, FRANCIS MILES2, JOHN1) was born 22 Jul 1847 in Gardner MA, and died Aft. 1920. He married JANE A RAY 31 May 1877 in Winchendon MA [5/30/1877 Gardner MA], daughter of ALMON RAY and OLIVE KEMP. She was born 07 Mar 1852 in MA, and died Aft. 1920.
i. LEON MILTON10 HOWE, b. 11 Oct 1886, Gardner MA; d. Aft. 1920. 53. GEORGE9 ROBBINS (REBECCA8 DUNSTER, REBECCA7 KENDALL, BENJAMIN6, BENJAMIN5, THOMAS4, THOMAS3, FRANCIS MILES2, JOHN1) was born 06 Dec 1827 in Leominster MA, and died 22 Jun 1892 in MA. He married CHARLOTTE MARANDA DENNIS 26 Dec 1850 in Barre MA. She was born 20 Jun 1831 in Barre MA, and died Aft. 1880.
i. CHARLES10 ROBBINS, b. 19 Nov 1859, Fitchburg MA; d. 28 Jan 1860, Fitchburg MA. ii. HENRY DENNIS ROBBINS, b. 03 Nov 1864, Fitchburg MA; d. 09 Oct 1905, Onset MA; m. FANNIE A SMITH, 01 Jun 1891, Fitchburg MA; b. Aug 1865, MA; d. Aft. 1900.
iii. GEORGE FREDDIE ROBBINS, b. 10 Jan 1870, Fitchburg MA; d. Aft. 1870. 54. CHARLES9 ROBBINS (REBECCA8 DUNSTER, REBECCA7 KENDALL, BENJAMIN6, BENJAMIN5, THOMAS4, THOMAS3, FRANCIS MILES2, JOHN1) was born 09 May 1830 in Leominster MA, and died 14 Aug 1897 in Somerville MA. He married ANGELINE H (RANDMAN) WILSON 22 May 1851 in Stoneham MA. She was born Abt. 1828 in Charlestown MA, and died 08 Nov 1895 in Somerville MA. i. JOSEPH10 ROBBINS, b. 20 May 1856, Melrose MA; d. 06 Apr 1904, Worcester MA; m. EVA D CLARK, 25 Dec 1880, Boston MA [12/22/1880 Deering ME]; b. Abt. 1859, ME; d. 15 Jul 1895, Somerville MA. ii. CARRIE L ROBBINS, b. 02 Jun 1859, Melrose MA; d. 13 Sep 1910, Somerville MA; m. JOHN H WINSBY, 05 Sep 1883, Boston MA; b. Apr 1855, Nova Scotia; d. Aft. 1920. 55. CAROLINE AUGUSTA9 ROBBINS (REBECCA8 DUNSTER, REBECCA7 KENDALL, BENJAMIN6, BENJAMIN5, THOMAS4, THOMAS3, FRANCIS MILES2, JOHN1) was born 16 Feb 1840 in Leominster MA, and died 04 Dec 1892 in Fitchburg MA. She married REUBEN DOW 30 Dec 1863 in Fitchburg MA. He was born 03 May 1835 in Nantucket MA, and died 03 Jan 1880 in MA. 107. i. WALTER GILMAN10 DOW, b. 30 Dec 1869, Fitchburg MA; d. 21 Mar 1940, Keene NH. ii. CHARLOTTE REBECCA DOW, b. 04 Apr 1873, Fitchburg MA; d. 11 Jun 1879, MA. 56. JEROME AUGUSTINE9 ROBBINS (REBECCA8 DUNSTER, REBECCA7 KENDALL, BENJAMIN6, BENJAMIN5, THOMAS4, THOMAS3, FRANCIS MILES2, JOHN1) was born 13 Nov 1844 in Leominster MA, and died 24 Aug 1900 in Somerville MA. He married SARAH ELIZABETH LANE 24 Feb 1876 in VT/Fitchburg MA, daughter of GEORGE LANE and ELIZABETH BAILEY. She was born Aug 1844 in Putney VT, and died 13 Nov 1905 in Somerville MA. 108. i. INEZ MARIE10 ROBBINS, b. 16 Oct 1879, Boston MA; d. Aft. 1940. 109. ii. MABEL ESTELLE ROBBINS, b. 04 Jul 1881, Somerville MA; d. Aft. 1940. 110. iii. GEORGE DUNSTER ROBBINS, b. Nov 1883, Somerville MA; d. Aft. 1940. 57. SARAH C9 DUNSTER (ASAPH8, REBECCA7 KENDALL, BENJAMIN6, BENJAMIN5, THOMAS4, THOMAS3, FRANCIS MILES2, JOHN1) was born 12 Sep 1836 in MA, and died 17 Sep 1916 in Chicago IL. She married WARREN M BROWN Abt. 1860. He was born 12 Dec 1837 in ME, and died 16 Apr 1914 in Chicago IL. i. EMMA C10 BROWN, b. 04 Aug 1863, Chicago IL; d. 22 Dec 1945, Chicago IL. 111. ii. FREEMAN EDWIN BROWN, b. 20 Sep 1865, Chicago IL; d. 28 Oct 1939, Chicago IL. iii. GRACIE BROWN, b. Abt. 1869, IL; d. Aft. 1870. 58. REBECCA HENRETTA9 DUNSTER (ASAPH8, REBECCA7 KENDALL, BENJAMIN6, BENJAMIN5, THOMAS4, THOMAS3, FRANCIS MILES2, JOHN1) was born Aug 1839 in Malden/Roseland MA, and died 03 Jul 1906 in Chicago IL. She married JAMES E COE. He was born Abt. 1834 in Torrington CT, and died Aft. 1910. 112. i. MARY JANE (JENNIE)10 COE, b. 29 Dec 1866, Chicago IL; d. 18 May 1942, Chicago IL. ii. LUCY FRANCES COE, b. Abt. 1869, Aurora IL; d. 02 Jun 1889, Chicago IL. iii. EDGAR A COE, b. 31 Jan 1872, Chicago IL; d. Aft. 1880.
iv. H NELSON COE, b. Jun 1873, IL; d. Aft. 1900.
v. JAMES A COE, b. 04 Nov 1876, Chicago IL; d. 08 Apr 1946, Milton Township IL; m. SARAH J ?. vi. WILLIAM E COE, b. 11 Oct 1878, Chicago IL; d. 01 Aug 1942, Chicago IL. 59. FRANK EDMUND9 NICHOLS (LYDIA8 DUNSTER, REBECCA7 KENDALL, BENJAMIN6, BENJAMIN5, THOMAS4, THOMAS3, FRANCIS MILES2, JOHN1) was born 27 Apr 1848 in Gardner MA, and died Aft. 1910. He married (1) ADA LOUISA SARGENT 10 Oct 1870 in Gardner MA, daughter of WILLARD SARGENT and LAVINIA ADAMS. She was born Abt. 1849 in Brattleboro VT, and died 11 Apr 1881 in Gardner MA. He married (2) LOTTIE L HILL 27 Sep 1882 in Gardner MA, daughter of HENRY HILL and PHEBE ?. She was born May 1860 in Arlington VT, and died Aft. 1930.
i. BERTHA ELIZA10 NICHOLS, b. 02 Mar 1875, Gardner MA; d. Aft. 1920; m. GILBERT G HARDY, 07 Oct 1896, Gardner MA; b. 30 Apr 1871, Gardner MA; d. Aft. 1920.
ii. LENA S10 NICHOLS, b. Mar 1884, MA; d. Aft. 1910. 60. EMMA PARSONS9 NICHOLS (LYDIA8 DUNSTER, REBECCA7 KENDALL, BENJAMIN6, BENJAMIN5, THOMAS4, THOMAS3, FRANCIS MILES2, JOHN1) was born 28 Aug 1850 in Gardner MA, and died 19 Mar 1903 in Somerville MA. She married JAMES E NEWTON 11 Oct 1871 in Gardner MA, son of IRA NEWTON and ELIZABETH ?. He was born Abt. 1845 in Phillipston MA, and died Aft. 1877.
i. LEON IRA10 NEWTON, b. 09 Apr 1878, Gardner MA; d. 25 Sep 1901, Cambridge MA. 61. WARREN DEROUSSE9 PARSON (DAPHENY LELAND8 DUNSTER, REBECCA7 KENDALL, BENJAMIN6, BENJAMIN5, THOMAS4, THOMAS3, FRANCIS MILES2, JOHN1) was born Feb 1851 in Quincy IL, and died Aft. 1910. He married ANNIE S ALMQUIST Abt. 1872 in Later divorced. She was born May 1852 in Sweden, and died Aft. 1920.
i. JOHN R10 PARSON, b. 15 Jan 1877, CO; d. 14 Jan 1941, Los Angeles CA. 113. ii. ALICE M PARSON, b. Nov 1880, CO; d. Aft. 1920.
iii. GEORGE W PARSON, b. May 1883, CO; d. Aft. 1908; m. MARGARET E KIRK, 31 Dec 1908, Los Angeles CA. 62. HELENA EMMA9 PARSONS (DAPHENY LELAND8 DUNSTER, REBECCA7 KENDALL, BENJAMIN6, BENJAMIN5, THOMAS4, THOMAS3, FRANCIS MILES2, JOHN1) was born 17 May 1861 in Leadville CO, and died 19 Jan 1913 in Pinedale WY. She married LEWIS ALLEN 11 Aug 1879 in Tetworth Ranch UT. He was born 02 Dec 1857 in Wales, and died 07 Nov 1930 in Rock Springs WY. i. WILLIAM H10 ALLEN, b. Aug 1880, UT; d. Aft. 1900.
ii. MARY H ALLEN, b. Jun 1883, UT; d. Aft. 1900.
iii. JOHN L ALLEN, b. Dec 1884, UT; d. Aft. 1900.
iv. THOMAS W ALLEN, b. Jan 1890, UT; d. Aft. 1900. 114. v. ANNIE GERTRUDE ALLEN, b. Aug 1893, UT; d. Aft. 1930.
vi. FRANK ALLEN, b. Oct 1895, UT; d. Aft. 1910.
vii. HANNAH E ALLEN, b. Aug 1899, UT; d. Aft. 1910.
viii. DAVID T ALLEN, b. Abt. 1902, UT; d. Aft. 1910. 63. SOLON9 KENDALL (ISAAC P8, MARTIN7, BENJAMIN6, BENJAMIN5, THOMAS4, THOMAS3, FRANCIS MILES2, JOHN1) was born Abt. 1831 in MA, and died Aft. 1880. He married (1) HARRIET WARREN PARTRIDGE 10 Mar 1857 in Gardner MA, daughter of SENECA PARTRIDGE and SALLY BROWN. She was born 16 Jan 1832 in Gardner MA, and died Aft. 1860. He married (2) MARIA E MEAD 14 Dec 1874 in Dodge Center MN. She was born Abt. 1842 in PA, and died Aft. 1880.
i. FRED PETER10 KENDALL, b. Abt. 1859, IL; d. 26 Jan 1949, Seattle WA. 64. MARY ELMIRA9 PERLEY (MARY8 KENDALL, MARTIN7, BENJAMIN6, BENJAMIN5, THOMAS4, THOMAS3, FRANCIS MILES2, JOHN1) was born 05 May 1822 in Gardner MA, and died 15 Jan 1900 in Baldwinville MA. She married JOHN NICHOLS 24 Jun 1847 in Gardner MA, son of JOHN NICHOLS and MERCY WOODWARD. He was born 27 Sep 1826 in Hubbardston MA, and died 14 Nov 1892 in Templeton MA. i. CHARLES ADDISON10 NICHOLS, b. 10 Jan 1850, Gardner MA; d. 05 Jul 1882, Boston MA; m. ELVA SOPHIA UPTON, 16 Dec 1871, Boston MA; b. 19 Mar 1850, Gardner MA; d. 1934.
ii. ADA ANNETTE NICHOLS, b. 29 Aug 1853, Gardner MA; d. Aft. 1880. 65. ASA PROCTOR9 PERLEY (MARY8 KENDALL, MARTIN7, BENJAMIN6, BENJAMIN5, THOMAS4, THOMAS3, FRANCIS MILES2, JOHN1) was born 04 Jun 1824 in Gardner MA, and died 26 Apr 1886 in Gardner MA. He married (1) LUCY ANN AUSTIN 18 Aug 1846 in Gardner MA [7/25/1846 Templeton MA], daughter of THOMAS AUSTIN and MARY ?. She was born 04 Mar 1826 in Surry NH, and died 11 Dec 1873 in Keene NH. He married (2) MARY ANN HASKELL (FORRISTALL) 03 Jan 1875 in Winchendon MA - divorced?, daughter of ABNER HASKELL and LAURA LAWRENCE. She was born Abt. 1830 in Troy NH, and died Aft. 1880.
i. ELLA ELIZA10 PERLEY, b. 20 May 1848, Gardner MA; d. Aft. 1920; m. JAMES W DODGE, 25 Apr 1865, Keene NH; b. 13 Apr 1845, Keene NH; d. Bet. 1910 - 1920. 115. ii. ALICE ANETTE PERLEY, b. 25 Aug 1850, Lebanon NH; d. 12 Dec 1904, Londonderry NH. 116. iii. EMMA JANE PERLEY, b. 30 Jul 1856, Troy NH; d. 09 Dec 1893, Hartford CT.
117. iv. WILLIAM FRED PERLEY, b. 30 Apr 1865, Keene NH; d. Aft. 1940. 66. CHARLES ADDISON9 PERLEY (MARY8 KENDALL, MARTIN7, BENJAMIN6, BENJAMIN5, THOMAS4, THOMAS3, FRANCIS MILES2, JOHN1) was born 15 Sep 1826 in Gardner MA, and died 02 Feb 1887 in Templeton MA. He married CHLOE WHITNEY 20 Apr 1847 in Gardner MA, daughter of SETH WHITNEY and CHLOE LINCOLN. She was born 04 Oct 1828 in Gardner MA, and died 30 Jul 1909 in Baldwinville MA. i. MARY ISABEL10 PERLEY, b. 24 Aug 1849, Gardner MA; d. Aft. 1920; m. HERBERT LELAND, 28 Nov 1867, Templeton MA; b. Abt. 1841, Templeton MA; d. 12 Mar 1900, Baldwinville MA. 118. ii. CHARLES ADDISON PERLEY, b. 30 Jun 1855, Baldwinville MA; d. 03 Feb 1938, St Petersburg FL. 67. GEORGE ALLEN9 PERLEY (MARY8 KENDALL, MARTIN7, BENJAMIN6, BENJAMIN5, THOMAS4, THOMAS3, FRANCIS MILES2, JOHN1) was born 08 Jul 1831 in Gardner MA, and died 14 May 1896 in Gardner MA. He married SUSAN NICHOLS 09 Aug 1853 in Gardner MA, daughter of JOHN NICHOLS and MERCY WOODWARD. She was born 19 Apr 1830 in Hubbardston MA, and died 22 Mar 1913 in Northampton MA. 119. i. LULA EMMEGON10 PERLEY, b. 19 Jun 1856, Gardner MA; d. Aft. 1930.
ii. FANNIE ELIZA PERLEY, b. 14 May 1861, Gardner MA; d. 01 May 1879, Gardner MA. 120. iii. JENNIE MABEL PERLEY, b. 07 May 1868, Gardner MA; d. 1957.
iv. ALONZO A PERLEY, b. Jul 1873, MA; d. Aft. 1910. 68. JAMES MONROE9 PERLEY (MARY8 KENDALL, MARTIN7, BENJAMIN6, BENJAMIN5, THOMAS4, THOMAS3, FRANCIS MILES2, JOHN1) was born 26 Feb 1834 in Gardner MA, and died 05 Jun 1907 in Baldwinville MA. He married FANNY E JOHNSON 07 Dec 1865 in Templeton MA, daughter of STEDMAN JOHNSON and CYNTHIA MERRITT. She was born 30 Nov 1843 in Templeton MA, and died Aft. 1900.
i. FRANK MONROE10 PERLEY, b. 07 Nov 1873, Templeton MA; d. 18 Sep 1874, Templeton MA. 69. FRANCIS WALTER9 PERLEY (MARY8 KENDALL, MARTIN7, BENJAMIN6, BENJAMIN5, THOMAS4, THOMAS3, FRANCIS MILES2, JOHN1) was born 04 May 1836 in Gardner MA, and died Aft. 1900. He married ADELINE GATES 01 Jul 1857 in Gardner MA - later divorced, daughter of AMOS GATES and BETSEY KEMP. She was born 13 Oct 1840 in Gardner MA, and died 08 Feb 1911 in Gardner MA. 121. i. GEORGE FRANCIS10 PERLEY, b. 04 Aug 1859, Gardner MA; d. Aft. 1940.
ii. NELLIE ELIZA PERLEY, b. 23 Mar 1865, Gardner MA; d. Aft. 1880. 70. THEOPHILUS PARSONS9 PERLEY (MARY8 KENDALL, MARTIN7, BENJAMIN6, BENJAMIN5, THOMAS4, THOMAS3, FRANCIS MILES2, JOHN1) was born 12 Nov 1838 in Gardner MA, and died 03 Dec 1901 in Gardner MA. He married ALICE ADELIA UPHAM 01 Sep 1866 in Templeton MA, daughter of JOSEPH UPHAM and SUSAN ?. She was born 13 Feb 1846 in Phillipston MA, and died Aft. 1930. 122. i. CARRIE FRANCES10 PERLEY, b. 20 Jul 1869, Fitchburg MA; d. Aft. 1940. 71. LEWIS S9 PERLEY (MARY8 KENDALL, MARTIN7, BENJAMIN6, BENJAMIN5, THOMAS4, THOMAS3, FRANCIS MILES2, JOHN1) was born 17 Jun 1844 in Gardner MA, and died 31 May 1912 in Baldwinville MA. He married (1) REBECCA M HOWE 08 Jan 1871 in Templeton MA, daughter of STEPHEN HOWE and BETSEY ?. She was born Abt. 1846 in Petersham MA, and died 27 Mar 1883 in Templeton MA. He married (2) ANNA E WRIGHT 29 Sep 1885 in Orange MA, daughter of HENRY WRIGHT and ELIZA WOODCOCK. She was born Jan 1853 in MA, and died Aft. 1930.
i. LOUIS HOWE10 PERLEY, b. 22 Oct 1871, Templeton MA; d. Aft. 1930.
ii. CHILD PERLEY, b. 04 May 1876, Templeton MA. 123. iii. RUTH W PERLEY, b. 27 Nov 1882, Templeton MA; d. Aft. 1920. 124. iv. BELLE WRIGHT10 PERLEY, b. 23 Sep 1888, Templeton MA; d. Aft. 1930. 125. v. PHILLIP SYLVESTER PERLEY, b. 27 Mar 1890, Templeton MA; d. Aft. 1940. 72. FREDERICK WILLIAM9 POWERS (ANNIS8 KENDALL, MARTIN7, BENJAMIN6, BENJAMIN5, THOMAS4, THOMAS3, FRANCIS MILES2, JOHN1) was born 03 Dec 1830 in Gardner MA, and died Bet. 1866 - 1870. He married ANN BARRY (BARRA, BARRE) 11 Oct 1854 in Fitchburg MA [10/7/1854 Gardner MA], daughter of FRANCIS BARRY. She was born Abt. 1830 in Ireland, and died Aft. 1880. 126. i. SARAH ANN10 POWERS, b. 22 Sep 1855, Gardner MA; d. Aft. 1910.
ii. CHARLES H POWERS, b. 11 May 1858, Gardner MA; d. Aft. 1870.
iii. EDWARD POWERS, b. 02 Dec 1861, Fitchburg MA; d. Aft. 1870.
iv. JOSEPH FRANCIS POWERS, b. 11 Oct 1865, Fitchburg MA; d. Aft. 1880.
v. WILLIE POWERS, b. Abt. 1867, MA; d. Aft. 1870. 73. ADALINE KENDALL9 POWERS (ANNIS8 KENDALL, MARTIN7, BENJAMIN6, BENJAMIN5, THOMAS4, THOMAS3, FRANCIS MILES2, JOHN1) was born 12 Apr 1834 in Gardner MA, and died 24 Dec 1894 in Gardner MA. She married EDWIN L KENDALL 15 May 1855 in Gardner MA, son of HUBBARD KENDALL and RHODA SAWIN. He was born 04 Oct 1832 in Gardner MA, and died 29 Dec 1893 in Gardner MA. Children are listed above under (36) Edwin L Kendall. 74. PRUDENCE ELIZABETH9 POWERS (ANNIS8 KENDALL, MARTIN7, BENJAMIN6, BENJAMIN5, THOMAS4, THOMAS3, FRANCIS MILES2, JOHN1) was born 16 May 1840 in Gardner MA, and died Aft. 1930. She married EDWIN BENNETT 13 Dec 1859 in Gardner MA, son of WILLIAM BENNETT and CATY FOLLET. He was born 30 Mar 1827 in Hubbardston MA, and died 08 Sep 1911 in Worcester MA. 127. i. CHESTER EUGENE10 BENNETT, b. 09 Jul 1861, Hubbardston MA; d. Aft. 1940.
ii. IDA A BENNETT, b. 09 Jun 1864, Hubbardston MA; d. 02 Jun 1904, Hubbardston MA; m. HERBERT W DAY, 08 Aug 1903, Hubbardston MA; b. Abt. 1874, Lawrence MA. 128. iii. EDWIN HARLAN BENNETT, b. 23 Apr 1868, Hubbardston MA; d. Aft. 1930. 75. LORENZO JONES9 POWERS (ANNIS8 KENDALL, MARTIN7, BENJAMIN6, BENJAMIN5, THOMAS4, THOMAS3, FRANCIS MILES2, JOHN1) was born Feb 1843 in Gardner MA, and died Aft. 1910. He married (1) LOUISA HOUGHTON 05 Apr 1865 in Bolton MA, daughter of STEPHEN HOUGHTON and JULIA HOUGHTON. She was born 17 Jul 1847 in Bolton MA, and died Bet. 1882 - 1900. He married (2) MARY ELIZABETH CHASE 01 Mar 1902 in Worcester MA, daughter of HARRISON CHASE and EMELINE NEWTON. She was born Abt. 1857 in MA, and died Aft. 1910. 129. i. GEORGE MARTIN10 POWERS, b. 06 Apr 1866, Gardner MA; d. Bet. 1930 - 1940. 130. ii. EDWIN BENNET POWERS, b. 01 Apr 1870, Hubbardston MA; d. Aft. 1930.
iii. IDA MAY POWERS, b. 16 Feb 1878, Bolton MA; d. 20 Aug 1878, Bolton MA. iv. ETHEL E POWERS, b. 06 May 1880, Gardner MA; d. 19 Aug 1880, Gardner MA. v. ELMER L POWERS, b. 27 Jul 1882, Gardner MA; d. 15 Sep 1882, Gardner MA. 76. AMOS PROCTOR9 POWERS (ANNIS8 KENDALL, MARTIN7, BENJAMIN6, BENJAMIN5, THOMAS4, THOMAS3, FRANCIS MILES2, JOHN1) was born Nov 1845 in MA, and died Aft. 1920. He married (1) ADELAIDE RICHARDSON BRADFORD 01 Jun 1862 in Bolton MA, daughter of JONATHAN BRADFORD and JEMIMA JONES. She was born 02 Aug 1848 in Turner ME, and died 30 Apr 1863 in Bolton MA. He married (2) ADALINE AUGUSTA WHITCOMB 23 Jun 1870 in Bolton MA, daughter of ASA WHITCOMB and ADALINE HOAR. She was born 31 Dec 1835 in Bolton MA, and died Bet. 1910 - 1920. 131. i. EDWARD LORENZO10 POWERS, b. 08 Jul 1862, Bolton MA - adopted by Amos & Julia Proctor; d. Aft. 1940. 77. HENRY AUGUSTUS9 POWERS (ANNIS8 KENDALL, MARTIN7, BENJAMIN6, BENJAMIN5, THOMAS4, THOMAS3, FRANCIS MILES2, JOHN1) was born 13 May 1848 in Gardner MA, and died Aft. 1920. He married CHARLOTTE E HUDSON 03 Jun 1869 in Hubbardston MA, daughter of NATHAN HUDSON and PRISCILLA ?. She was born Apr 1850 in MA, and died Aft. 1920.
i. ALFRED HENRY10 POWERS, b. 18 Aug 1870, Gardner MA; d. Bet. 1930 - 1940; m. JULIA ALBERTA OSSENE; b. Abt. 1874, CT; d. Aft. 1940.
ii. CHARLES H POWERS, b. 01 Mar 1876, Worcester MA; d. Aft. 1920.
iii. LESLIE MARTIN POWERS, b. 09 Aug 1877, Worcester MA; d. Aft. 1930; m. MAUD EVELYN LOTHROP, 19 Sep 1907, Worcester MA; b. Abt. 1884, MA; d. Aft. 1930. 78. ELIZA ANN9 KENDALL (DAVID8, MARTIN7, BENJAMIN6, BENJAMIN5, THOMAS4, THOMAS3, FRANCIS MILES2, JOHN1) was born 09 May 1837 in Gardner MA, and died 1916. She married JOHN HOAR MINOTT 14 Sep 1854 in Gardner MA, son of JOHN MINOTT and MARY HARDY. He was born 18 Jun 1827 in Westminster MA, and died 10 Dec 1896 in Gardner MA. i. JEANETT E10 MINOTT, b. 07 Mar 1857, Gardner MA; d. 15 Oct 1857, Gardner MA. ii. HENRY WOOD MINOTT, b. 01 Sep 1863, Gardner MA; d. 01 Jun 1873, Gardner MA. 132. iii. GEORGE LEON MINOTT, b. 15 Apr 1866, Gardner MA; d. 1934. 79. GEORGE9 KENDALL (DAVID8, MARTIN7, BENJAMIN6, BENJAMIN5, THOMAS4, THOMAS3, FRANCIS MILES2, JOHN1) was born 01 Mar 1839 in Gardner MA, and died 1922. He married SARAH O HOWE 24 Aug 1859 in Gardner MA, daughter of STEPHEN HOWE and ARVILLA ROBINSON. She was born Abt. 1840 in Newport NH, and died 23 Dec 1898 in Gardner MA. i. WILLIE HOBART10 KENDALL, b. 28 Jan 1860, Gardner MA; d. 1938; m. MARY JANE KENDALL, 25 Oct 1881, Gardner MA; b. 18 Mar 1860, Jamaica VT; d. 1929. 80. ELLEN J9 KENDALL (DAVID8, MARTIN7, BENJAMIN6, BENJAMIN5, THOMAS4, THOMAS3, FRANCIS MILES2, JOHN1) was born 28 Apr 1843 in Gardner MA, and died 03 Nov 1875 in Gardner MA. She married THOMAS B GOODSPEED 08 Aug 1862 in Fitchburg MA, son of DANIEL GOODSPEED and MARY BAKER. He was born 23 Sep 1840 in Gardner MA, and died 17 May 1911 in Worcester MA. i. NELLIE LUCY10 GOODSPEED, b. 28 Dec 1873, Gardner MA; d. 25 Jan 1874, Gardner MA. 81. FRANCENA MARIA9 KENDALL (DAVID8, MARTIN7, BENJAMIN6, BENJAMIN5, THOMAS4, THOMAS3, FRANCIS MILES2, JOHN1) was born 09 Jan 1848 in Gardner MA, and died 1935. She married ORRIN CLARK JILLSON 16 Jun 1869 in Gardner MA, son of PAUL JILLSON and ZILPHIA SWEET. He was born 24 Dec 1827 in Richmond NH, and died 1887. 133. i. LOUIS KENDALL10 JILLSON, b. 09 Dec 1870, Grafton MA; d. Aft. 1930.
ii. HARRY M JILLSON, b. Jun 1874, MA; d. 1945. 82. CHARLES OTIS9 KENDALL (DAVID8, MARTIN7, BENJAMIN6, BENJAMIN5, THOMAS4, THOMAS3, FRANCIS MILES2, JOHN1) was born 21 Dec 1853 in Gardner MA, and died 09 Jan 1902 in Gardner MA. He married MARY L MURPHY (MURRAY) 12 May 1880 in Gardner MA, daughter of CORNELIUS MURPHY and JOHANNAH ?. She was born Jan 1852 in MA, and died Aft. 1920.
i. GEORGE DAVID10 KENDALL, b. 09 Oct 1881, Gardner MA; d. Aft. 1906. 134. ii. MAY JOSEPHINE KENDALL, b. Mar 1885, MA; d. Aft. 1911.
iii. CHARLES WEBSTER KENDALL, b. 22 Apr 1888, Gardner MA; d. Aft. 1900. 83. FRANK H9 KENDALL (DAVID8, MARTIN7, BENJAMIN6, BENJAMIN5, THOMAS4, THOMAS3, FRANCIS MILES2, JOHN1) was born Mar 1855 in MA, and died Aft. 1920. He married CORA MARIA LEARNED 18 Jan 1882 in Gardner MA, daughter of FRANCIS LEARNED and SARAH NEWTON. She was born Sep 1860 in MA, and died Aft. 1920.
i. LUCY10 KENDALL, b. 18 Oct 1882, Gardner MA; d. Aft. 1906. 135. ii. NELSON LEARNED KENDALL, b. 30 Dec 1886, Gardner MA; d. Aft. 1940.
iii. MARION P KENDALL, b. 21 Oct 1889, Gardner MA; d. Aft. 1900.
iv. FRANK HERBERT KENDALL, b. 12 Feb 1897, Gardner MA; d. Aft. 1920. 84. FLORA A9 KENDALL (DAVID8, MARTIN7, BENJAMIN6, BENJAMIN5, THOMAS4, THOMAS3, FRANCIS MILES2, JOHN1) was born 07 Dec 1861 in Gardner MA, and died 30 Apr 1880 in Gardner MA. She married EDWARD ALLEN STONE 02 Oct 1879 in Gardner MA, son of JOTHAM STONE and CAROLINE ALLEN. He was born 01 Sep 1853 in Hubbardston MA, and died 04 Sep 1941.
i. FLORA LUCY10 STONE, b. 22 Mar 1880, Gardner MA; d. 19 Sep 1966. 85. MARY ELLEN (HELEN)9 STODDARD (BARTLETT8, MIRIAM7 KENDALL, BENJAMIN6, BENJAMIN5, THOMAS4, THOMAS3, FRANCIS MILES2, JOHN1) was born 14 Jul 1847 in Lowell MA, and died Aft. 1920. She married JOHN W SMALL 04 Jun 1868 in Boston MA, son of FREDERICK C SMALL. He was born Sep 1845 in MA, and died Aft. 1920.
i. NELLIE L10 SMALL, b. Sep 1870, MA; d. Aft. 1940; m. EDWIN E EMERSON, 22 Jun 1910, St Paul MN; b. Abt. 1844, MA; d. Bet. 1920 - 1940.
ii. FREDERICK EUGENE SMALL, b. 05 Jun 1875, Boston MA; d. 01 Mar 1878, Boston MA. iii. ETHEL B SMALL, b. 08 Feb 1880, Boston MA; d. Aft. 1940. 86. LUCY G10 KENDALL (WILLIAM BODEN9, DANIEL BRACKETT8, ASAPH7, BENJAMIN6, BENJAMIN5, THOMAS4, THOMAS3, FRANCIS MILES2, JOHN1) was born Jun 1879 in WI, and died Aft. 1920. She married GEORGE H DREW. He was born Abt. 1867 in NJ, and died Aft. 1920.
i. ELIZABETH G11 DREW, b. Abt. 1911, NJ; d. Aft. 1920. 87. ARTHUR LIONEL10 KENDALL (EDWIN L9, HUBBARD8, JONATHAN7, BENJAMIN6, BENJAMIN5, THOMAS4, THOMAS3, FRANCIS MILES2, JOHN1) was born 20 Aug 1857 in Gardner MA, and died 1937. He married JENNIE F COLEMAN 16 Dec 1880 in Gardner MA, daughter of HERVEY COLEMAN and SARAH FRENCH. She was born 28 Nov 1862 in Templeton MA, and died 1944. 136. i. CLARENCE VERNILLIS11 KENDALL, b. 02 Jun 1881, Gardner MA; d. Aft. 1940.
ii. WALTER LARUE KENDALL, b. 19 Nov 1883, Gardner MA; d. 29 Apr 1884, Gardner MA. 137. iii. HAROLD ROLAND KENDALL, b. 12 Jan 1889, Gardner MA; d. 1921.
iv. EDWIN EARLE KENDALL, b. 22 Mar 1892, Gardner MA; d. Aft. 1920. 88. ALBERT EDWARD10 KENDALL (EDWIN L9, HUBBARD8, JONATHAN7, BENJAMIN6, BENJAMIN5, THOMAS4, THOMAS3, FRANCIS MILES2, JOHN1) was born 10 Nov 1862 in MA, and died 1933. He married MARY I HOUSELEY 31 Aug 1887 in Gardner MA, daughter of HERMAN HOUSELEY and ELMINA ?. She was born Jul 1864 in VT, and died Aft. 1920. 138. i. HAROLD ALBERT11 KENDALL, b. 25 Feb 1888, Gardner MA; d. Aft. 1940. 139. ii. HERMAN CHARLES KENDALL, b. 04 Oct 1889, Gardner MA; d. Aft. 1940. 140. iii. STANLEY GUY KENDALL, b. 29 Apr 1892, Gardner MA; d. 03 Jul 1980, Gardner MA. 89. HELEN10 KENDALL (EDWIN L9, HUBBARD8, JONATHAN7, BENJAMIN6, BENJAMIN5, THOMAS4, THOMAS3, FRANCIS MILES2, JOHN1) was born 09 Sep 1870 in Gardner MA, and died Aft. 1940. She married HARRY FRANCIS TURNEY. He was born Abt. 1869 in Canada, and died Aft. 1940.
i. MYRON WARREN11 TURNEY, b. 10 May 1892, Gardner MA; d. 11 May 1892, Gardner MA. ii. BLANCHE HENRIETTA TURNEY, b. 15 Jul 1893, Gardner MA; d. Aft. 1910.
iii. HOWARD ASA TURNEY, b. 29 May 1896, Gardner MA; d. 01 Sep 1911, Templeton MA. iv. BERNICE MILDRED TURNEY, b. 23 Nov 1897, Templeton MA; d. Aft. 1921.
v. EDITH ADELINE TURNEY, b. 06 Nov 1901, Templeton MA; d. Aft. 1910.
vi. LOUISE BEATRICE TURNEY, b. 09 Feb 1909, Templeton MA; d. Aft. 1930.
vii. MILTON FRANCIS TURNEY, b. 24 Sep 1912, Templeton MA; d. Aft. 1930. 90. WILLIAM HUBBARD10 KENDALL (EDWARD A9, HUBBARD8, JONATHAN7, BENJAMIN6, BENJAMIN5, THOMAS4, THOMAS3, FRANCIS MILES2, JOHN1) was born 17 Oct 1857 in Jamaica VT, and died 11 Feb 1908 in Gardner MA. He married MARY FRANCES COLEMAN Abt. 1880, daughter of HERVEY COLEMAN and SARAH FRENCH. She was born 04 Dec 1855 in Templeton MA, and died 1937. 141. i. EMMA MAUDE11 KENDALL, b. 14 Oct 1880, Gardner MA; d. 1950. 91. LILLIAN MELISSA10 JILLSON (ABIGAIL S9 KENDALL, HUBBARD8, JONATHAN7, BENJAMIN6, BENJAMIN5, THOMAS4, THOMAS3, FRANCIS MILES2, JOHN1) was born Jun 1856 in MA, and died Aft. 1930. She married DANIEL WEBSTER FAIRBANKS 25 Jun 1878 in Winchendon/Royalston MA, son of SARDIS FAIRBANK and CAROLINE DAVIS. He was born 10 Oct 1856 in Templeton MA, and died Bet. 1910 - 1920.
i. ERNEST E11 FAIRBANKS, b. 18 Oct 1878, Winchendon MA; d. Aft. 1920. 142. ii. GRACE LILLIAN FAIRBANKS, b. 17 Oct 1881, Gardner MA; d. Aft. 1930.
iii. CHILD FAIRBANKS, b. 28 Nov 1884, Gardner MA. iv. CHARLES WALTER FAIRBANKS, b. 06 Mar 1886, Gardner MA; d. Aft. 1911. 92. ALICE HARRIET10 JILLSON (ABIGAIL S9 KENDALL, HUBBARD8, JONATHAN7, BENJAMIN6, BENJAMIN5, THOMAS4, THOMAS3, FRANCIS MILES2, JOHN1) was born 29 Apr 1861 in Gardner MA, and died 10 Apr 1902 in Gardner MA. She married FRED BERT CLARK 25 Apr 1884 in Winchendon MA, son of ALBERT CLARK and JEMIMA ?. He was born 01 Nov 1862 in Springfield MA, and died 1956. 143. i. ROY L11 CLARK, b. 02 Jun 1887, Springfield MA; d. Aft. 1940. 93. GEORGE WASHINGTON10 JILLSON (ABIGAIL S9 KENDALL, HUBBARD8, JONATHAN7, BENJAMIN6, BENJAMIN5, THOMAS4, THOMAS3, FRANCIS MILES2, JOHN1) was born 11 Jul 1869 in Fitchburg MA, and died Aft. 1940. He married (1) MAGGIE M NOLAN 05 Sep 1894 in Gardner MA, daughter of THOMAS NOLAN and ADDRIAN ACKER. She was born Abt. 1877 in Lunenburg Nova Scotia, and died 22 Dec 1912 in Malden MA. He married (2) MARY ISABELLE MINER LAPIERE 07 Jun 1915 in Somerville MA, daughter of FRED LAPIERE and IDA VALENTINE. She was born Abt. 1876 in VT, and died Aft. 1940.
i. EVA MAY11 JILLSON, b. 15 Jan 1897, Gardner MA; d. Aft. 1920; m. EVERETT MANSON TILTON, 20 Feb 1915, Somerville MA. ii. MERTON HENRY JILLSON, b. 31 Oct 1898, Gardner MA; d. Aft. 1920.
iii. HAROLD HERMAN JILLSON, b. 25 Jun 1904, Gardner MA; d. Aft. 1920. 94. ALVAH F10 MCFARLAND (HARRIET ELLEN9 KENDALL, HUBBARD8, JONATHAN7, BENJAMIN6, BENJAMIN5, THOMAS4, THOMAS3, FRANCIS MILES2, JOHN1) was born Nov 1857 in MA, and died Bet. 1920 - 1930. He married LAVINIA ROBERTSON Abt. 1880, daughter of THOMAS ROBERTSON and ELIZA ?. She was born Abt. 1859 in MA, and died Aft. 1940. 144. i. WILLIAM ALVAH11 MCFARLAND, b. 22 Dec 1880, Somerset MA; d. Aft. 1942. 145. ii. ARCHIE W MCFARLAND, b. Dec 1884, MA; d. Aft. 1940. 95. MINNIE10 MCFARLAND (HARRIET ELLEN9 KENDALL, HUBBARD8, JONATHAN7, BENJAMIN6, BENJAMIN5, THOMAS4, THOMAS3, FRANCIS MILES2, JOHN1) was born 06 Oct 1858 in Gardner MA, and died Bet. 1910 - 1940. She married ALEXANDER ROBERT AMOS 10 Aug 1887 in Norfolk MA, son of ALEXANDER AMOS and HELEN (DAVIDSON). He was born 13 May 1862 in Edinburgh Scotland, and died Aft. 1940.
i. ALEXANDER11 AMOS, b. 08 Mar 1891, Worcester MA; d. 09 Mar 1891, Worcester MA. 146. ii. ALEXANDER R AMOS, b. Jul 1895, CT; d. Aft. 1940. 96. SARAH AUGUSTA10 COLEMAN (LAFAYETTE9, EUNICE8 KENDALL, JONATHAN7, BENJAMIN6, BENJAMIN5, THOMAS4, THOMAS3, FRANCIS MILES2, JOHN1) was born 13 Jul 1851 in Hubbardston MA, and died 03 Apr 1899 in Gardner MA. She married CHARLES S TENNEY 22 Jul 1874 in VT, son of JAMES TENNEY and RHODA ?. He was born Jul 1851 in MA, and died Aft. 1920. 147. i. SADIE E11 TENNEY, b. Oct 1887, MA; d. Aft. 1940. 97. GEORGE MELDAN10 COLEMAN (LAFAYETTE9, EUNICE8 KENDALL, JONATHAN7, BENJAMIN6, BENJAMIN5, THOMAS4, THOMAS3, FRANCIS MILES2, JOHN1) was born 07 Oct 1861 in Gardner MA, and died Aft. 1930. He married CLARA LIZZIE RAY 12 Nov 1884 in Templeton MA, daughter of CALVIN RAY and ALMIRA STODDARD. She was born 09 Jun 1861 in Gardner MA, and died Aft. 1930.
i. LEON R11 COLEMAN, b. Abt. 1887, Gardner MA; d. 01 Jan 1887, Gardner MA. 148. ii. MARY ETHEL LEONE COLEMAN, b. 27 Nov 1888, Gardner MA; d. Aft. 1930.
iii. EARL RAY COLEMAN, b. Feb 1899, Gardner MA; d. 19 Oct 1900, Gardner MA. iv. GLADYS MILDRED COLEMAN, b. 04 Mar 1903, Gardner MA; d. Aft. 1930. 98. HENRY JILLSON10 COLEMAN (LAFAYETTE9, EUNICE8 KENDALL, JONATHAN7, BENJAMIN6, BENJAMIN5, THOMAS4, THOMAS3, FRANCIS MILES2, JOHN1) was born 23 May 1866 in Gardner MA, and died Aft. 1930. He married NELLIE J ESTEY 19 Dec 1891 in Gardner MA, daughter of DANIEL ESTEY. She was born Feb 1874 in MA, and died Aft. 1930. 149. i. CARL LAFAYETTE11 COLEMAN, b. 23 Mar 1892, Gardner MA; d. Aft. 1940. 150. ii. HARRY A COLEMAN, b. 13 Jun 1893, Gardner MA; d. Aft. 1930. 99. ORRISON EVERETT10 COLEMAN (FREDERICK A9, EUNICE8 KENDALL, JONATHAN7, BENJAMIN6, BENJAMIN5, THOMAS4, THOMAS3, FRANCIS MILES2, JOHN1) was born 17 Jan 1855 in Gardner MA, and died 16 Oct 1919 in Gardner MA. He married CARRIE FRANCES MANN 30 May 1876 in Dover/Needham MA - Later divorced. She was born Abt. 1861 in MA, and died Aft. 1880.
i. MARY R11 COLEMAN, b. 28 Dec 1877, Dover MA; d. 27 Nov 1880, Gardner MA. ii. MYRA B COLEMAN, b. Abt. 1880, Dover MA; d. 04 Dec 1880, Gardner MA. 100. FANNY MABEL10 COLEMAN (MELVIN9, EUNICE8 KENDALL, JONATHAN7, BENJAMIN6, BENJAMIN5, THOMAS4, THOMAS3, FRANCIS MILES2, JOHN1) was born 06 Feb 1871 in Gardner MA, and died 24 Sep 1920 in Philadelphia PA. She married WALTER P NOYES 19 Jun 1892 in Gardner MA. He died 15 Oct 1932 in Philadelphia PA.
i. ELIZABETH E11 NOYES, b. 11 Dec 1892, Gardner MA; d. 10 Jan 1893, Gardner MA. 101. EMMA PHILLIPS10 COLEMAN (MELVIN9, EUNICE8 KENDALL, JONATHAN7, BENJAMIN6, BENJAMIN5, THOMAS4, THOMAS3, FRANCIS MILES2, JOHN1) was born 01 Jul 1876 in Gardner MA, and died 16 Nov 1952 in Richmond Hill NY. She married ARTHUR LEON STONE 06 Jul 1898 in Gardner MA, son of AI STONE and SUSAN JAQUITH. He was born 23 Jun 1870 in Gardner MA, and died 06 May 1943 in Richmond Hill NY. i. NORMA EVELYN11 STONE, b. 25 Oct 1905, Gardner MA; d. Aft. 1930.
ii. VELMA ARLEON STONE, b. 06 Nov 1910, Gardner MA; d. Aft. 1930. 102. FRANK CHESTER10 BISHOP (ANSEL9, REBECCA8 KENDALL, JONATHAN7, BENJAMIN6, BENJAMIN5, THOMAS4, THOMAS3, FRANCIS MILES2, JOHN1) was born 23 Apr 1868 in Westminster MA, and died Aft. 1920. He married (1) ETTA M WILLARD 19 May 1890 in NH - later divorced. She was born May 1865 in VT, and died Aft. 1910. He married (2) LILLIAN BERTHA COVEY 27 Nov 1906 in Keene NH, daughter of SILAS COVEY and HATTIE STOWE. She was born Abt. 1865 in NH, and died Aft. 1920. 151. i. PAUL WILLARD11 BISHOP, b. 13 Nov 1891, Keene NH; d. Aft. 1940. 152. ii. PERLEY GORDON BISHOP, b. 15 Mar 1894, VT; d. Aft. 1940. 153. iii. ARTHUR ANSEL BISHOP, b. 23 Jan 1897, Saxton's River VT; d. Aft. 1941.
iv. BERTHA MAY BISHOP, b. 12 Dec 1900, Winchendon MA; d. Aft. 1921; m. WILLIAM K RAMSEY, 24 Sep 1921, Peterborough NH; b. Abt. 1893. 103. FRED O10 BISHOP (SAMUEL9, REBECCA8 KENDALL, JONATHAN7, BENJAMIN6, BENJAMIN5, THOMAS4, THOMAS3, FRANCIS MILES2, JOHN1) was born 17 Aug 1875 in Swanzey NH, and died 28 Jan 1904 in Fitchburg MA. He married HANNAH C DAY 04 Jul 1894 in Fitchburg/Leominster MA. She was born Abt. 1874, and died Aft. 1895.
i. PEARL MINNIE11 BISHOP, b. 10 Jun 1895, Leominster MA; d. Aft. 1914; m. LEONARD DAVIS PIERCE, 01 Dec 1914, Brattleboro VT; b. Apr 1894, VT; d. Aft. 1930. 104. STELLA AGNEW10 BISHOP (SAMUEL9, REBECCA8 KENDALL, JONATHAN7, BENJAMIN6, BENJAMIN5, THOMAS4, THOMAS3, FRANCIS MILES2, JOHN1) was born 18 Mar 1881 in Sawnzey NH, and died Aft. 1900. She married HENRY S NASH 30 Sep 1899 in Winchendon MA. He was born May 1856 in Winchendon MA, and died 1922.
i. EUNICE ELEANOR11 NASH, b. 06 Nov 1905, Baldwinville MA; d. 21 Apr 1914, Baldwinville MA. 105. BELVA AGNES10 PLANTIER (LUCY F9 HOWE, FANNY8 KENDALL, JONATHAN7, BENJAMIN6, BENJAMIN5, THOMAS4, THOMAS3, FRANCIS MILES2, JOHN1) was born 12 Jul 1884 in Gardner MA, and died Jun 1964 in MA. She married LEROY CLEVELAND TARR 03 Jun 1908 in Gardner MA, son of HENRY TARR and ELLEN PARSONS. He was born 16 Jan 1881 in Gloucester MA, and died 1947.
i. ESTHER11 TARR, b. 19 Sep 1911, Gardner MA; d. 1933. 106. ALICE AMY10 PLANTIER (LUCY F9 HOWE, FANNY8 KENDALL, JONATHAN7, BENJAMIN6, BENJAMIN5, THOMAS4, THOMAS3, FRANCIS MILES2, JOHN1) was born 20 May 1889 in Gardner MA, and died 1961. She married GEORGE ELLIOT CRAMM 21 Sep 1910 in Gardner MA, son of NATHAN CRAMM and ISADORA LINCOLN. He was born 21 Nov 1888 in Gardner MA, and died 1947.
i. DOROTHY ELIZABETH11 CRAMM, b. 12 Jun 1911, Gardner MA; d. 29 Jan 2009, Baldwinville MA; m. WAINO ANDREW NIEMELA; b. 15 Jul 1907, MA; d. 29 Apr 2000, Templeton MA. ii. CHARLES E CRAMM, b. Abt. 1913, MA; d. Aft. 1930.
iii. ALICE LOUISE CRAMM, b. 07 Aug 1914, Gardner MA; d. Aft. 1940.
iv. RICHARD M CRAMM, b. Abt. 1917, MA; d. Aft. 1920.
v. MARGERY N CRAMM, b. Abt. 1920, MA; d. Aft. 1940.
vi. CHESTER P CRAMM, b. Abt. 1923, MA; d. Aft. 1940.
vii. ROBERT C CRAMM, b. Abt. 1926, MA; d. Aft. 1940.
viii. LEONARD P CRAMM, b. Abt. 1929, MA; d. Aft. 1940. 107. WALTER GILMAN10 DOW (CAROLINE AUGUSTA9 ROBBINS, REBECCA8 DUNSTER, REBECCA7 KENDALL, BENJAMIN6, BENJAMIN5, THOMAS4, THOMAS3, FRANCIS MILES2, JOHN1) was born 30 Dec 1869 in Fitchburg MA, and died 21 Mar 1940 in Keene NH. He married ROSE SCHONTAG 12 Dec 1894 in Buckland/Fitchburg MA. She was born Jan 1874 in MA, and died Aft. 1940.
i. WALTER GILMAN11 DOW, b. 14 Jun 1895, Fitchburg MA; d. Aft. 1900. 108. INEZ MARIE10 ROBBINS (JEROME AUGUSTINE9, REBECCA8 DUNSTER, REBECCA7 KENDALL, BENJAMIN6, BENJAMIN5, THOMAS4, THOMAS3, FRANCIS MILES2, JOHN1) was born 16 Oct 1879 in Boston MA, and died Aft. 1940. She married SILAS EVERETT BAILEY 03 May 1899 in Somerville MA. He was born Abt. 1878 in ME, and died Aft. 1940.
i. BEATRICE MARIE11 BAILEY, b. 27 Nov 1900, Medford MA. ii. DORIS ANNA BAILEY, b. 29 Sep 1902, Somerville MA; d. 25 Jan 1903, Somerville MA. iii. FORREST JEROME BAILEY, b. 26 Aug 1904, Somerville MA; d. 13 Sep 1904, Somerville MA. iv. SILAS E BAILEY, b. Abt. 1916, MA; d. Aft. 1930. 109. MABEL ESTELLE10 ROBBINS (JEROME AUGUSTINE9, REBECCA8 DUNSTER, REBECCA7 KENDALL, BENJAMIN6, BENJAMIN5, THOMAS4, THOMAS3, FRANCIS MILES2, JOHN1) was born 04 Jul 1881 in Somerville MA, and died Aft. 1940. She married EZRA FRANCIS MELENDY 20 Feb 1901 in Somerville MA. He was born Abt. 1873 in ME, and died Aft. 1940.
i. CLIFFORD RUSSELL11 MELENDY, b. 13 Jul 1902, Somerville MA; d. 26 Feb 1912, Boston MA. ii. IRVING DUNSTER MELENDY, b. 11 Feb 1908, Somerville MA; d. Aft. 1930.
iii. PAUL G MELENDY, b. Abt. 1919, MA; d. Aft. 1940. 110. GEORGE DUNSTER10 ROBBINS (JEROME AUGUSTINE9, REBECCA8 DUNSTER, REBECCA7 KENDALL, BENJAMIN6, BENJAMIN5, THOMAS4, THOMAS3, FRANCIS MILES2, JOHN1) was born Nov 1883 in Somerville MA, and died Aft. 1940. He married JESSIE LENA SMITH 27 Mar 1906 in Somerville MA, daughter of CORA E ?. She was born Abt. 1884 in ME, and died Aft. 1940.
i. THELMA11 ROBBINS, b. 09 Sep 1906, Roxbury MA; d. Aft. 1920.
ii. BERNICE ROBBINS, b. 22 Dec 1908, Somerville MA; d. Aft. 1930.
iii. STANLEY JEROME ROBBINS, b. 01 Jan 1913, Somerville MA; d. Aft. 1930.
iv. KENNETH C ROBBINS, b. Abt. 1919, MA; d. Aft. 1940.
v. THEODORE W ROBBINS, b. Abt. 1922, MA; d. Aft. 1940.
vi. MARJORIE ROBBINS, b. Abt. 1923, MA; d. Aft. 1945; m. JOHN CLELAND SMITH, 14 May 1945, int Nashua NH. 111. FREEMAN EDWIN10 BROWN (SARAH C9 DUNSTER, ASAPH8, REBECCA7 KENDALL, BENJAMIN6, BENJAMIN5, THOMAS4, THOMAS3, FRANCIS MILES2, JOHN1) was born 20 Sep 1865 in Chicago IL, and died 28 Oct 1939 in Chicago IL. He married MAY H VREELAND 13 Jul 1892 in Cook IL. She was born May 1871 in IL, and died Aft. 1930.
i. HELEN V E11 BROWN, b. Abt. 1897, IL; d. Aft. 1920. 154. ii. GRACE LOUISE BROWN, b. 17 Aug 1903, Chicago IL; d. Aft. 1930. 112. MARY JANE (JENNIE)10 COE (REBECCA HENRETTA9 DUNSTER, ASAPH8, REBECCA7 KENDALL, BENJAMIN6, BENJAMIN5, THOMAS4, THOMAS3, FRANCIS MILES2, JOHN1) was born 29 Dec 1866 in Chicago IL, and died 18 May 1942 in Chicago IL. She married GEORGE OLIVER Abt. 1897. He was born Nov 1866 in IL, and died Aft. 1900.
i. EDGAR11 OLIVER, b. Sep 1899, IL; d. Aft. 1900. 113. ALICE M10 PARSON (WARREN DEROUSSE9, DAPHENY LELAND8 DUNSTER, REBECCA7 KENDALL, BENJAMIN6, BENJAMIN5, THOMAS4, THOMAS3, FRANCIS MILES2, JOHN1) was born Nov 1880 in CO, and died Aft. 1920. She married BARZILLA FADDIS BAUDER. He was born Abt. 1881 in MO, and died Aft. 1920.
i. FORREST EVERT11 BAUDER, b. 14 Dec 1906, San Joaquin CA; d. 27 Jan 1970, Victoria British Columbia; m. JUANITA MAUD ABBOTT. ii. KENNETH AUSTIN BAUDER, b. 09 Feb 1910, CA; d. 08 Jan 1984, Marin CA; m. VELMA ? ; b. Abt. 1912, ID; d. Aft. 1940. 114. ANNIE GERTRUDE10 ALLEN (HELENA EMMA9 PARSONS, DAPHENY LELAND8 DUNSTER, REBECCA7 KENDALL, BENJAMIN6, BENJAMIN5, THOMAS4, THOMAS3, FRANCIS MILES2, JOHN1) was born Aug 1893 in UT, and died Aft. 1930. She married RAY A CANTLIN. He was born Abt. 1885 in CO, and died Aft. 1930.
i. DALLAS A11 CANTLIN, b. Abt. 1916, WY; d. Aft. 1930.
ii. DOROTHY L CANTLIN, b. Abt. 1917, UT; d. Aft. 1930.
iii. THOMAS E CANTLIN, b. Abt. 1921, CO; d. Aft. 1930.
iv. JOHN W CANTLIN, b. Abt. 1924, WY; d. Aft. 1930.
v. ALICE M CANTLIN, b. Abt. 1928, WY; d. Aft. 1930. 115. ALICE ANETTE10 PERLEY (ASA PROCTOR9, MARY8 KENDALL, MARTIN7, BENJAMIN6, BENJAMIN5, THOMAS4, THOMAS3, FRANCIS MILES2, JOHN1) was born 25 Aug 1850 in Lebanon NH, and died 12 Dec 1904 in Londonderry NH. She married WESLEY JEROME WILKINS 04 Jun 1873, son of ELIJAH WILKINS and HARRIET DAVIS. He was born 11 Apr 1852 in NH, and died Aft. 1910. 155. i. HERBERT EMERSON11 WILKINS, b. 26 May 1874, Keene NH; d. Aft. 1920. 156. ii. BENSON PERLEY WILKINS, b. 08 Feb 1876, Keene NH; d. Aft. 1940. 116. EMMA JANE10 PERLEY (ASA PROCTOR9, MARY8 KENDALL, MARTIN7, BENJAMIN6, BENJAMIN5, THOMAS4, THOMAS3, FRANCIS MILES2, JOHN1) was born 30 Jul 1856 in Troy NH, and died 09 Dec 1893 in Hartford CT. She married ARTHUR W FISHER 19 May 1875 in Keene NH. He was born Apr 1855 in NH, and died Aft. 1900.
i. JOHN A11 FISHER, b. Jul 1886, CT; d. Aft. 1900. 117. WILLIAM FRED10 PERLEY (ASA PROCTOR9, MARY8 KENDALL, MARTIN7, BENJAMIN6, BENJAMIN5, THOMAS4, THOMAS3, FRANCIS MILES2, JOHN1) was born 30 Apr 1865 in Keene NH, and died Aft. 1940. He married KATE LOUISE WHEELER 06 May 1891 in VT. She was born Nov 1866 in VT, and died Aft. 1940.
i. CATHERINE11 PERLEY, b. Abt. 1904; d. 04 Nov 1904, VT.
ii. CATHERINE PERLEY, b. 03 Nov 1906, VT; d. 03 Nov 1906, Bellows Falls VT.
iii. WILLIAM F PERLEY, b. Abt. 1909, VT; d. Aft. 1910. 118. CHARLES ADDISON10 PERLEY (CHARLES ADDISON9, MARY8 KENDALL, MARTIN7, BENJAMIN6, BENJAMIN5, THOMAS4, THOMAS3, FRANCIS MILES2, JOHN1) was born 30 Jun 1855 in Baldwinville MA, and died 03 Feb 1938 in St Petersburg FL. He married MARY ELLA WAITE Abt. 1881. She was born Aug 1858 in MA, and died Aft. 1930.
i. RALPH WAITE11 PERLEY, b. 07 Dec 1882, Templeton MA; d. 11 Dec 1884, Templeton MA. ii. MARION WAITE PERLEY, b. Apr 1886, MA; d. Aft. 1910; m. EDWIN RUEL WARFIELD, 05 Nov 1910, Baldwinville MA. iii. MARY MARGARET PERLEY, b. 06 Apr 1892, Templeton MA; d. Aft. 1914; m. URBAN MAURICE OLIVER, 30 Jun 1914, Baldwinville MA. 157. iv. HELEN MILDRED PERLEY, b. 06 Apr 1892, Templeton MA; d. Aft. 1920. 119. LULA EMMEGON10 PERLEY (GEORGE ALLEN9, MARY8 KENDALL, MARTIN7, BENJAMIN6, BENJAMIN5, THOMAS4, THOMAS3, FRANCIS MILES2, JOHN1) was born 19 Jun 1856 in Gardner MA, and died Aft. 1930. She married GEORGE W MASON 20 Oct 1875 in Gardner MA, son of HENRY MASON and EMILY HALL. He was born Abt. 1851 in MA, and died Aft. 1930. 158. i. HARRY WARREN11 MASON, b. 12 May 1876, Gardner MA; d. Aft. 1940. 159. ii. ETHEL LOUISE MASON, b. 17 Sep 1878, Gardner MA; d. Aft. 1940. 120. JENNIE MABEL10 PERLEY (GEORGE ALLEN9, MARY8 KENDALL, MARTIN7, BENJAMIN6, BENJAMIN5, THOMAS4, THOMAS3, FRANCIS MILES2, JOHN1) was born 07 May 1868 in Gardner MA, and died 1957. She married (1) CHARLES HERMAN (HARRIS) GODDARD 28 Sep 1887 in Gardner MA - later divorced, son of AUGUSTUS GODDARD and ABBIE WILKINSON. He was born Jul 1865 in Templeton MA, and died 25 Feb 1912 in East Bridgewater MA. She married (2) WALTER HERBERT HINDS 18 Jun 1896 in Gardner MA, son of ABIJAH HINDS and HARRIET WARD. He was born 20 Oct 1861 in Gardner MA, and died 1932.
i. NORMA L11 GODDARD, b. Sep 1889, NH; d. Aft. 1940. 121. GEORGE FRANCIS10 PERLEY (FRANCIS WALTER9, MARY8 KENDALL, MARTIN7, BENJAMIN6, BENJAMIN5, THOMAS4, THOMAS3, FRANCIS MILES2, JOHN1) was born 04 Aug 1859 in Gardner MA, and died Aft. 1940. He married (1) ? ?. He married (2) RENA ROSA CLARK 03 Jan 1882 in Gardner MA, daughter of LEONARD CLARK and SUSAN HOVEY. She was born May 1859 in MA, and died Bet. 1930 - 1940.
i. GEORGE R11 PERLEY, b. Dec 1872, MA; d. Aft. 1900.
ii. WALLACE E11 PERLEY, b. Sep 1885, MA; d. Aft. 1930. 122. CARRIE FRANCES10 PERLEY (THEOPHILUS PARSONS9, MARY8 KENDALL, MARTIN7, BENJAMIN6, BENJAMIN5, THOMAS4, THOMAS3, FRANCIS MILES2, JOHN1) was born 20 Jul 1869 in Fitchburg MA, and died Aft. 1940. She married JOHN F MINER 23 Oct 1895 in Gardner /Templeton MA, son of JONATHAN MINER and CAROLINE GOODRICH. He was born Jul 1871 in MA, and died Aft. 1940.
i. DAUGHTER11 MINER, b. 03 Dec 1903, Gardner MA; d. 03 Dec 1903, Gardner MA. ii. HAROLD PERLEY MINER, b. 15 Apr 1905, Gardner MA; d. Aft. 1940. 123. RUTH W10 PERLEY (LEWIS S9, MARY8 KENDALL, MARTIN7, BENJAMIN6, BENJAMIN5, THOMAS4, THOMAS3, FRANCIS MILES2, JOHN1) was born 27 Nov 1882 in Templeton MA, and died Aft. 1920. She married JOHN M GORDON 19 Jul 1905 in Baldwinville MA. He was born Abt. 1876 in White Sulphur Spings VA (WV), and died Aft. 1910.
i. LOIS PERLEY11 GORDON, b. 22 Oct 1909, Templeton MA; d. Aft. 1920. 124. BELLE WRIGHT10 PERLEY (LEWIS S9, MARY8 KENDALL, MARTIN7, BENJAMIN6, BENJAMIN5, THOMAS4, THOMAS3, FRANCIS MILES2, JOHN1) was born 23 Sep 1888 in Templeton MA, and died Aft. 1930. She married ERNEST W RICHARDS 15 Jul 1908 in Gardner MA. He was born Abt. 1886 in England, and died Aft. 1930.
i. MELVIN ERNEST11 RICHARDS, b. 24 Dec 1909, Gardner MA; d. Aft. 1920.
ii. MARION V RICHARDS, b. Abt. 1918, NY; d. Aft. 1930. 125. PHILLIP SYLVESTER10 PERLEY (LEWIS S9, MARY8 KENDALL, MARTIN7, BENJAMIN6, BENJAMIN5, THOMAS4, THOMAS3, FRANCIS MILES2, JOHN1) was born 27 Mar 1890 in Templeton MA, and died Aft. 1940. He married SADIE A HOLLINGSWORTH 08 Feb 1912 in Fitchburg MA, daughter of ARTHUR HOLLINGSWORTH and ELLEN ?. She was born Abt. 1891 in Nova Scotia, and died Aft. 1940.
i. MERVIN LOUIS11 PERLEY, b. 12 Sep 1912, Athol MA; d. Aft. 1940; m. ELEANOR M ? ; b. Abt. 1912, MA; d. Aft. 1940. 126. SARAH ANN10 POWERS (FREDERICK WILLIAM9, ANNIS8 KENDALL, MARTIN7, BENJAMIN6, BENJAMIN5, THOMAS4, THOMAS3, FRANCIS MILES2, JOHN1) was born 22 Sep 1855 in Gardner MA, and died Aft. 1910. She married FRANCIS WILLIAM WHITMAN 10 Oct 1877 in Northborough MA, son of THOMAS WHITMAN and ADALINE WHITCOMB. He was born 14 Apr 1854 in Bolton MA, and died 06 Jul 1905 in Hudson MA. 160. i. ADDIE ELIZABETH11 WHITMAN, b. 22 May 1878, Hudson MA; d. Aft. 1940.
ii. IDA ALBERTA WHITMAN, b. 19 Jan 1886, Hudson MA; d. Aft. 1930.
iii. MARION EDITH WHITMAN, b. 10 Aug 1890, Hudson MA; d. Aft. 1920. 127. CHESTER EUGENE10 BENNETT (PRUDENCE ELIZABETH9 POWERS, ANNIS8 KENDALL, MARTIN7, BENJAMIN6, BENJAMIN5, THOMAS4, THOMAS3, FRANCIS MILES2, JOHN1) was born 09 Jul 1861 in Hubbardston MA, and died Aft. 1940. He married CARRIE L GILBERT 12 Sep 1888 in Hubbardston MA. She was born Apr 1869 in MA, and died Aft. 1940.
i. CHARLES HOWARD11 BENNETT, b. 04 Nov 1889, Hubbardston MA; d. Aft. 1930.
ii. MERTON LA ROY BENNETT, b. 03 Apr 1893, Hubbardston MA; d. Aft. 1914.
iii. EDWIN ALBERT BENNETT, b. 17 Jan 1898, Hubbardston MA; d. Aft. 1940. 128. EDWIN HARLAN10 BENNETT (PRUDENCE ELIZABETH9 POWERS, ANNIS8 KENDALL, MARTIN7, BENJAMIN6, BENJAMIN5, THOMAS4, THOMAS3, FRANCIS MILES2, JOHN1) was born 23 Apr 1868 in Hubbardston MA, and died Aft. 1930. He married ABBIE M FLAGG 06 Jul 1897 in Hubbardston MA. She was born Abt. 1877 in MA, and died Aft. 1930.
i. WILLIAM HARVEY11 BENNETT, b. 09 Apr 1898, Hubbardston MA; d. 09 Sep 1898, Hubbardston MA. ii. CHILD BENNETT, b. 04 Nov 1899, Hubbardston MA; d. 05 Nov 1899, Hubbardston MA. iii. EDITH MAY BENNETT, b. 04 Jan 1902, Hubbardston MA; d. Aft. 1920.
iv. ROBERT S BENNETT, b. 28 Oct 1905, MA; d. 25 Dec 1985, Wareham MA. v. ELIZABETH BENNETT, b. 19 Nov 1908, Worcester MA; d. Aft. 1920.
vi. HOWARD F BENNETT, b. 03 Jan 1911, Worcester MA; d. Aft. 1930. 129. GEORGE MARTIN10 POWERS (LORENZO JONES9, ANNIS8 KENDALL, MARTIN7, BENJAMIN6, BENJAMIN5, THOMAS4, THOMAS3, FRANCIS MILES2, JOHN1) was born 06 Apr 1866 in Gardner MA, and died Bet. 1930 - 1940. He married JESSIE D CHAPMAN 13 Nov 1886 in Gardner MA, daughter of WILLIAM CHAPMAN and LYDIA ?. She was born Abt. 1867 in NH, and died Aft. 1940.
i. ROY LORENZO11 POWERS, b. 28 Oct 1887, Worcester MA; d. Aft. 1910.
ii. EVA L POWERS, b. 25 Jan 1894, Worcester MA. iii. PAUL C POWERS, b. 12 Sep 1896, Worcester MA; d. Aft. 1920.
iv. MILFORD HOLDEN POWERS, b. 13 Apr 1898, West Auburn MA; d. Aft. 1920. 161. v. BLANCHE H POWERS, b. 26 Dec 1900, Hubbardston MA; d. Aft. 1940. 130. EDWIN BENNET10 POWERS (LORENZO JONES9, ANNIS8 KENDALL, MARTIN7, BENJAMIN6, BENJAMIN5, THOMAS4, THOMAS3, FRANCIS MILES2, JOHN1) was born 01 Apr 1870 in Hubbardston MA, and died Aft. 1930. He married EDITH MAY FENNO 26 Nov 1890 in Gardner MA, daughter of LYMAN FENNO and MARY MILLER. She was born 24 Mar 1872 in Gardner MA, and died Aft. 1930.
i. EMMA L11 POWERS, b. 27 Mar 1891, Gardner MA; d. 30 Mar 1891, Gardner MA. ii. ALTON E POWERS, b. 27 May 1895, MA; d. 27 Mar 1987, Fairhaven MA. iii. LOLA EDITH POWERS, b. 23 Dec 1896, North Brookfield MA; d. Aft. 1910.
iv. GLENN E POWERS, b. Jan 1900, MA; d. 02 Oct 1970, New Bedford MA. v. VIVIAN POWERS, b. 09 Dec 1901, Worcester MA; d. Aft. 1920.
vi. CLYDE L POWERS, b. 11 Oct 1907, New Bedford MA; d. Aft. 1930.
vii. RUTH ELLEN POWERS, b. 16 Feb 1910, New Bedford MA; d. Aft. 1940. 131. EDWARD LORENZO10 POWERS (AMOS PROCTOR9, ANNIS8 KENDALL, MARTIN7, BENJAMIN6, BENJAMIN5, THOMAS4, THOMAS3, FRANCIS MILES2, JOHN1) was born 08 Jul 1862 in Bolton MA - adopted by Amos & Julia Proctor, and died Aft. 1940. He married ANNA M BARNES 11 Oct 1885 in Bolton MA, daughter of LEONARD BARNES and ZERVIAH PARMENTER. She was born Apr 1855 in MA, and died Aft. 1940.
i. ARTHUR EVERETT11 POWERS, b. 15 Oct 1886, Bolton MA; d. Aft. 1909.
ii. DAUGHTER POWERS, b. 02 Apr 1890, Bolton MA; d. 02 Apr 1890, Bolton MA. 132. GEORGE LEON10 MINOTT (ELIZA ANN9 KENDALL, DAVID8, MARTIN7, BENJAMIN6, BENJAMIN5, THOMAS4, THOMAS3, FRANCIS MILES2, JOHN1) was born 15 Apr 1866 in Gardner MA, and died 1934. He married JESSIE ELIZABETH GOURLEY Abt. 1892, daughter of THOMAS GOURLEY and MARY ?. She was born 04 Sep 1871 in Milford NH, and died 1953. 162. i. GLADYS E11 MINOTT, b. 06 Dec 1892, Gardner MA; d. 09 Nov 1983, Gardner MA. ii. MADELINE LOUISE MINOTT, b. 25 Mar 1899, Gardner MA; d. 06 Sep 1899, Gardner MA. iii. HENRY WYMOUTH MINOTT, b. 26 Sep 1900, Gardner MA; d. Aft. 1920.
iv. GEORGE L MINOTT, b. 23 Feb 1908, MA; d. 12 Jul 2004, MA. v. WINONA DOROTHY MINOTT, b. 11 Dec 1912, Gardner MA; d. Aft. 1930. 133. LOUIS KENDALL10 JILLSON (FRANCENA MARIA9 KENDALL, DAVID8, MARTIN7, BENJAMIN6, BENJAMIN5, THOMAS4, THOMAS3, FRANCIS MILES2, JOHN1) was born 09 Dec 1870 in Grafton MA, and died Aft. 1930. He married (1) JULIA B ?. She was born Abt. 1869 in NY, and died Aft. 1940. He married (2) ALICE MAY KNOWLTON 03 Feb 1892 in Gardne MA, daughter of CHARLES KNOWLTON and MARY EATON. She was born 16 Sep 1873 in MA, and died Aft. 1930.
i. MILDRED ALICE11 JILLSON, b. 25 Sep 1892, Gardner MA; d. Aft. 1920.
ii. LOUISE JILLSON, b. Abt. 1905, NY; d. Aft. 1930. 134. MAY JOSEPHINE10 KENDALL (CHARLES OTIS9, DAVID8, MARTIN7, BENJAMIN6, BENJAMIN5, THOMAS4, THOMAS3, FRANCIS MILES2, JOHN1) was born Mar 1885 in MA, and died Aft. 1911. She married GUY HARRY SHEPARD 22 Apr 1907 in Fitchburg MA. He was born Abt. 1883 in Highgate VT.
i. ROBERT KENDALL11 SHEPARD, b. 29 Mar 1911, Gardner MA; d. 27 Dec 1968, Gardner MA; m. (1) GERALDINE RITCHIE FORHAN; b. 09 Dec 1916, Lowell MA; d. 01 Feb 1940, Gardner MA; m. (2) LORETTA DORIS LEBLANC; b. 23 Jul 1919, Bridgton ME; d. 06 Jun 2007, Gardner MA. 135. NELSON LEARNED10 KENDALL (FRANK H9, DAVID8, MARTIN7, BENJAMIN6, BENJAMIN5, THOMAS4, THOMAS3, FRANCIS MILES2, JOHN1) was born 30 Dec 1886 in Gardner MA, and died Aft. 1940. He married HELEN HOLMES PARKER 31 Aug 1912 in Gardner MA. She was born Abt. 1888 in MA, and died Aft. 1940.
i. ELIZABETH11 KENDALL, b. 01 Jun 1913, Gardner MA; d. 25 Jul 1988, Hubbardston MA; m. WALTER E NORBERG; b. 02 Feb 1910, IL; d. 31 Aug 1992, Hubbardston MA. ii. DAVID N KENDALL, b. Abt. 1917, MA; d. Aft. 1940.
iii. NELSON L KENDALL, b. 19 Jun 1920, MA; d. 18 Jul 1976, Gardner MA. iv. CALVIN D KENDALL, b. Abt. 1929, MA; d. Aft. 1940.
v. PARKER H KENDALL, b. Abt. 1930, MA; d. Aft. 1940. 136. CLARENCE VERNILLIS11 KENDALL (ARTHUR LIONEL10, EDWIN L9, HUBBARD8, JONATHAN7, BENJAMIN6, BENJAMIN5, THOMAS4, THOMAS3, FRANCIS MILES2, JOHN1) was born 02 Jun 1881 in Gardner MA, and died Aft. 1940. He married ORILA M PERRY 23 Oct 1915 in Gardner MA. She was born Abt. 1892 in NY, and died Aft. 1930.
i. DORIS I12 KENDALL, b. Abt. 1916, MA; d. Aft. 1930.
ii. DONALD A KENDALL, b. Abt. 1919, MA; d. Aft. 1930.
iii. RUTH I KENDALL, b. Abt. 1921, MA; d. Aft. 1930.
iv. PAUL D KENDALL, b. Abt. 1929, MA; d. Aft. 1930. 137. HAROLD ROLAND11 KENDALL (ARTHUR LIONEL10, EDWIN L9, HUBBARD8, JONATHAN7, BENJAMIN6, BENJAMIN5, THOMAS4, THOMAS3, FRANCIS MILES2, JOHN1) was born 12 Jan 1889 in Gardner MA, and died 1921. He married (1) ANNIE KING. He married (2) BERNICE I JORDAN 10 May 1909 in Fitchburg MA. She was born Abt. 1891 in MA, and died Aft. 1910.
i. VIRGINIA FRENCH COLEMAN12 KENDALL, b. 04 Aug 1919, Gardner MA; d. 08 Jul 1920, Gardner MA. ii. EDWIN ERNEST12 KENDALL, b. 25 Nov 1909, Gardner MA; d. 02 Aug 1910, Gardner MA. 138. HAROLD ALBERT11 KENDALL (ALBERT EDWARD10, EDWIN L9, HUBBARD8, JONATHAN7, BENJAMIN6, BENJAMIN5, THOMAS4, THOMAS3, FRANCIS MILES2, JOHN1) was born 25 Feb 1888 in Gardner MA, and died Aft. 1940. He married ERMA LUCIA MERRILL in by 1917, daughter of WILLIAM MERRILL and JANE JAQUITH. She was born 28 Jun 1893 in VT, and died Aft. 1940.
i. JUNE12 KENDALL, b. Abt. 1917, MA; d. Aft. 1940.
ii. WINTERS M KENDALL, b. Abt. 1919, IA; d. Aft. 1940.
iii. CHRISTINE KENDALL, b. Abt. 1920, VT; d. Aft. 1940.
iv. STEWART KENDALL, b. Abt. 1923, VT; d. Aft. 1940.
v. BARBARA KENDALL, b. Abt. 1925, VT; d. Aft. 1930.
vi. ELAINE KENDALL, b. Abt. 1927, VT; d. Aft. 1940. 139. HERMAN CHARLES11 KENDALL (ALBERT EDWARD10, EDWIN L9, HUBBARD8, JONATHAN7, BENJAMIN6, BENJAMIN5, THOMAS4, THOMAS3, FRANCIS MILES2, JOHN1) was born 04 Oct 1889 in Gardner MA, and died Aft. 1940. He married MARIE LUKE in by 1921. She was born Abt. 1895 in Canada, and died Aft. 1940.
i. HERMAN E12 KENDALL, b. Abt. 1921, ME; d. Aft. 1940.
ii. JOHN HOADLEY KENDALL, b. 04 Jan 1923, Cumberland County ME; d. 02 Apr 1979, Morehead City NC; m. SHIZUKO HELEN MURATA. iii. DAVID KENDALL, b. Abt. 1925, ME; d. Aft. 1940.
iv. MARIE KENDALL, b. Abt. 1925, ME; d. Aft. 1940.
v. ROBERT KENDALL, b. Abt. 1926, ME; d. Aft. 1940.
vi. LESLIE KENDALL, b. Abt. 1928, ME; d. Aft. 1940.
vii. WARREN KENDALL, b. Abt. 1932, ME; d. Aft. 1940. 140. STANLEY GUY11 KENDALL (ALBERT EDWARD10, EDWIN L9, HUBBARD8, JONATHAN7, BENJAMIN6, BENJAMIN5, THOMAS4, THOMAS3, FRANCIS MILES2, JOHN1) was born 29 Apr 1892 in Gardner MA, and died 03 Jul 1980 in Gardner MA. He married RUTH VOSE WOODBURY, daughter of CHARLES WOODBURY and MARIA HILL. She was born 21 Mar 1893 in Gardner MA, and died Aft. 1940.
i. ALLAN H12 KENDALL, b. Abt. 1922, MA; d. Aft. 1940.
ii. FAITH KENDALL, b. Abt. 1930, MA; d. Aft. 1940. 141. EMMA MAUDE11 KENDALL (WILLIAM HUBBARD10, EDWARD A9, HUBBARD8, JONATHAN7, BENJAMIN6, BENJAMIN5, THOMAS4, THOMAS3, FRANCIS MILES2, JOHN1) was born 14 Oct 1880 in Gardner MA, and died 1950. She married (1) PRENTICE HOWES THOMAS, son of CHARLES THOMAS and OLIVE HOWES. He was born 14 May 1867 in Danvers MA, and died 1937. She married (2) EVERETT FRANKLIN NUTTING 21 Feb 1901 in Gardner MA, son of BENJAMIN NUTTING and EMMA YOUNG. He was born 12 Aug 1877 in Gardner MA, and died 1917.
i. VIOLA IVIS12 NUTTING, b. 06 Sep 1901, Gardner MA; d. 1963.
ii. STANLEY ROGER NUTTING, b. 31 Oct 1905, Gardner MA; d. Aft. 1930; m. GERTRUDE L PARSONS, 03 Jun 1922, Portsmouth NH. 142. GRACE LILLIAN11 FAIRBANKS (LILLIAN MELISSA10 JILLSON, ABIGAIL S9 KENDALL, HUBBARD8, JONATHAN7, BENJAMIN6, BENJAMIN5, THOMAS4, THOMAS3, FRANCIS MILES2, JOHN1) was born 17 Oct 1881 in Gardner MA, and died Aft. 1930. She married CHARLES N SPICER 17 Sep 1902 in Gardner MA. He was born Abt. 1880 in CT, and died Aft. 1930.
i. LUCIE A12 SPICER, b. Abt. 1905, CT; d. Aft. 1930.
ii. ROBERT J SPICER, b. Abt. 1908, MA; d. Aft. 1930. 143. ROY L11 CLARK (ALICE HARRIET10 JILLSON, ABIGAIL S9 KENDALL, HUBBARD8, JONATHAN7, BENJAMIN6, BENJAMIN5, THOMAS4, THOMAS3, FRANCIS MILES2, JOHN1) was born 02 Jun 1887 in Springfield MA, and died Aft. 1940. He married RUTH E STEVENS 30 Sep 1908 in Needham MA. She was born Abt. 1887 in MA, and died Aft. 1940.
i. ALICE LOUISE12 CLARK, b. 05 Jul 1909, MA; d. Aft. 1920. 144. WILLIAM ALVAH11 MCFARLAND (ALVAH F10, HARRIET ELLEN9 KENDALL, HUBBARD8, JONATHAN7, BENJAMIN6, BENJAMIN5, THOMAS4, THOMAS3, FRANCIS MILES2, JOHN1) was born 22 Dec 1880 in Somerset MA, and died Aft. 1942. He married ANNA PHILLIPS BEALS 20 Feb 1907 in Bridgewater MA. She was born Abt. 1884 in MA, and died Aft. 1940.
i. EVELYN M12 MCFARLAND, b. Abt. 1908, MA; d. Aft. 1920.
ii. BEATRCIE A MCFARLAND, b. Abt. 1909, MA; d. Aft. 1930.
iii. MARGUERITE MCFARLAND, b. Abt. 1911, MA; d. Aft. 1930.
iv. WILLIAM ALVAH MCFARLAND, b. 29 May 1912, Bridgewater MA; d. Aft. 1930.
v. WINSTON MCFARLAND, b. Abt. 1914, MA; d. Aft. 1930.
vi. KENDALL MCFARLAND, b. Abt. 1917, MA; d. Aft. 1940.
vii. IRVING MCFARLAND, b. Abt. 1919, MA; d. Aft. 1940. 145. ARCHIE W11 MCFARLAND (ALVAH F10, HARRIET ELLEN9 KENDALL, HUBBARD8, JONATHAN7, BENJAMIN6, BENJAMIN5, THOMAS4, THOMAS3, FRANCIS MILES2, JOHN1) was born Dec 1884 in MA, and died Aft. 1940. He married BERTHA M KISMAYER. She was born Abt. 1888 in MA, and died Aft. 1940.
i. MILDRED RUTH12 MCFARLAND, b. 04 May 1915, Medfield MA; d. Aft. 1920.
ii. EDWARD A MCFARLAND, b. Abt. 1917, MA; d. Aft. 1940.
iii. ROBERT F MCFARLAND, b. Abt. 1918, MA; d. Aft. 1940. 146. ALEXANDER R11 AMOS (MINNIE10 MCFARLAND, HARRIET ELLEN9 KENDALL, HUBBARD8, JONATHAN7, BENJAMIN6, BENJAMIN5, THOMAS4, THOMAS3, FRANCIS MILES2, JOHN1) was born Jul 1895 in CT, and died Aft. 1940. He married MARGARET ?. She was born Abt. 1900 in PA, and died Aft. 1940.
i. MARJORIE L12 AMOS, b. Abt. 1924, PA; d. Aft. 1940. 147. SADIE E11 TENNEY (SARAH AUGUSTA10 COLEMAN, LAFAYETTE9, EUNICE8 KENDALL, JONATHAN7, BENJAMIN6, BENJAMIN5, THOMAS4, THOMAS3, FRANCIS MILES2, JOHN1) was born Oct 1887 in MA, and died Aft. 1940. She married THOMAS A GOODWIN 22 Sep 1909 in Gardner MA, son of WALTER GOODWIN and VASHTI GATES. He was born Abt. 1883 in Weymouth Nova Scotia, and died Aft. 1940.
i. RICHARD E12 GOODWIN, b. 30 Jun 1910, Gardner MA; d. Aft. 1930.
ii. DONALD A GOODWIN, b. 14 Jun 1914, Gardner MA; d. 08 Mar 1915, Gardner MA. iii. RALPH R GOODWIN, b. Abt. 1917, MA; d. Aft. 1940. 148. MARY ETHEL LEONE11 COLEMAN (GEORGE MELDAN10, LAFAYETTE9, EUNICE8 KENDALL, JONATHAN7, BENJAMIN6, BENJAMIN5, THOMAS4, THOMAS3, FRANCIS MILES2, JOHN1) was born 27 Nov 1888 in Gardner MA, and died Aft. 1930. She married BERNIE HAROLD BROWN 29 May 1912 in Gardner MA. He was born 28 Apr 1890 in Leominster MA, and died Aft. 1930.
i. DOROTHY A12 BROWN, b. Abt. 1918, MA; d. Aft. 1930. 149. CARL LAFAYETTE11 COLEMAN (HENRY JILLSON10, LAFAYETTE9, EUNICE8 KENDALL, JONATHAN7, BENJAMIN6, BENJAMIN5, THOMAS4, THOMAS3, FRANCIS MILES2, JOHN1) was born 23 Mar 1892 in Gardner MA, and died Aft. 1940. He married JANET G ?. She was born Abt. 1894 in RI, and died Aft. 1940.
i. GEORGE L12 COLEMAN, b. Abt. 1925, CT; d. Aft. 1940.
ii. GORDON G COLEMAN, b. Abt. 1927, CT; d. Aft. 1940.
iii. JANET G COLEMAN, b. Abt. 1928, CT; d. Aft. 1940.
iv. HENRY S COLEMAN, b. Abt. 1930, CT; d. Aft. 1940. 150. HARRY A11 COLEMAN (HENRY JILLSON10, LAFAYETTE9, EUNICE8 KENDALL, JONATHAN7, BENJAMIN6, BENJAMIN5, THOMAS4, THOMAS3, FRANCIS MILES2, JOHN1) was born 13 Jun 1893 in Gardner MA, and died Aft. 1930. He married GRACE E ?. She was born Abt. 1895 in MA, and died Aft. 1930.
i. VICTOR H12 COLEMAN, b. Abt. 1917, MA; d. Aft. 1930.
ii. JANET E COLEMAN, b. Abt. 1919, MA; d. Aft. 1930.
iii. HARRY A COLEMAN, b. Abt. 1921, MA; d. Aft. 1930.
iv. RODMAN L COLEMAN, b. Abt. 1929, MA; d. Aft. 1930. 151. PAUL WILLARD11 BISHOP (FRANK CHESTER10, ANSEL9, REBECCA8 KENDALL, JONATHAN7, BENJAMIN6, BENJAMIN5, THOMAS4, THOMAS3, FRANCIS MILES2, JOHN1) was born 13 Nov 1891 in Keene NH, and died Aft. 1940. He married RUTH A GREENE 29 Jun 1910 in East Jaffrey NH. She was born Abt. 1892 in NH, and died Aft. 1940.
i. ROBERT D12 BISHOP, b. Abt. 1912, NH; d. Aft. 1940.
ii. SON BISHOP, b. Abt. 1913; d. 28 Jun 1913, Peterborough NH. iii. KENNETH P BISHOP, b. Abt. 1915, NH; d. Aft. 1940.
iv. HAROLD G BISHOP, b. Abt. 1917, NH; d. Aft. 1940.
v. RAYMOND ANSEL BISHOP, b. Abt. 1919, NH; d. Aft. 1939; m. ETHEL LOLA HUBLEY, 30 Sep 1939, Jaffrey NH; b. Abt. 1923, NH; d. Aft. 1939. 152. PERLEY GORDON11 BISHOP (FRANK CHESTER10, ANSEL9, REBECCA8 KENDALL, JONATHAN7, BENJAMIN6, BENJAMIN5, THOMAS4, THOMAS3, FRANCIS MILES2, JOHN1) was born 15 Mar 1894 in VT, and died Aft. 1940. He married GLADY M ?. She was born Abt. 1896 in England, and died Aft. 1930.
i. GARDNER M12 BISHOP, b. Abt. 1923, MA; d. Aft. 1930.
ii. RUSSELL G BISHOP, b. Abt. 1924, MA; d. Aft. 1930.
iii. DONALD P BISHOP, b. Abt. 1925, MA; d. Aft. 1930. 153. ARTHUR ANSEL11 BISHOP (FRANK CHESTER10, ANSEL9, REBECCA8 KENDALL, JONATHAN7, BENJAMIN6, BENJAMIN5, THOMAS4, THOMAS3, FRANCIS MILES2, JOHN1) was born 23 Jan 1897 in Saxton's River VT, and died Aft. 1941. He married (1) ETTA MCLAUGHLIN 02 Dec 1915 in East Jaffrey NH - later divorced. She was born Abt. 1898 in MA, and died Aft. 1930. He married (2) NORMA BERRY 28 Apr 1941 in Manchester NH. i. IRENE G12 BISHOP, b. Abt. 1917, NH; d. Aft. 1930.
ii. RUBY F BISHOP, b. Abt. 1919, NH; d. Aft. 1930.
iii. ARLENE A BISHOP, b. Abt. 1920, NH; d. Aft. 1930.
iv. LAWRENCE C BISHOP, b. Abt. 1921, NH; d. Aft. 1930. 154. GRACE LOUISE11 BROWN (FREEMAN EDWIN10, SARAH C9 DUNSTER, ASAPH8, REBECCA7 KENDALL, BENJAMIN6, BENJAMIN5, THOMAS4, THOMAS3, FRANCIS MILES2, JOHN1) was born 17 Aug 1903 in Chicago IL, and died Aft. 1930. She married CLAYTON M LAUGHLIN. He was born Abt. 1898 in IL, and died Aft. 1930.
i. CLAYTON F12 LAUGHLIN, b. Abt. 1929, IL; d. Aft. 1930. 155. HERBERT EMERSON11 WILKINS (ALICE ANETTE10 PERLEY, ASA PROCTOR9, MARY8 KENDALL, MARTIN7, BENJAMIN6, BENJAMIN5, THOMAS4, THOMAS3, FRANCIS MILES2, JOHN1) was born 26 May 1874 in Keene NH, and died Aft. 1920. He married (1) LILLIAN ADDIE LAMPREY 20 Jul 1897 in Laconia NH. She was born Abt. 1875 in Laconia NH, and died Bet. 1900 - 1910. He married (2) EDITH W KEYES 1910. She was born Abt. 1880 in MA, and died Aft. 1920.
i. MALCOLM12 WILKINS, b. Abt. 1892, Bellows Falls VT; d. Aft. 1900. 156. BENSON PERLEY11 WILKINS (ALICE ANETTE10 PERLEY, ASA PROCTOR9, MARY8 KENDALL, MARTIN7, BENJAMIN6, BENJAMIN5, THOMAS4, THOMAS3, FRANCIS MILES2, JOHN1) was born 08 Feb 1876 in Keene NH, and died Aft. 1940. He married MARTHA ADELIE FIFIELD 09 Oct 1901 in Methuen MA. She was born Abt. 1880 in MA, and died Aft. 1930.
i. DORIS F12 WILKINS, b. Abt. 1903, MA; d. Aft. 1920. 157. HELEN MILDRED11 PERLEY (CHARLES ADDISON10, CHARLES ADDISON9, MARY8 KENDALL, MARTIN7, BENJAMIN6, BENJAMIN5, THOMAS4, THOMAS3, FRANCIS MILES2, JOHN1) was born 06 Apr 1892 in Templeton MA, and died Aft. 1920. She married THOMAS LAMB 02 Oct 1915 in Boston MA, son of HORATIO LAMB and ANNIE ROTCH. He was born 19 Jan 1892 in Milton MA, and died Aft. 1916.
i. HELEN E12 LAMB, b. Abt. 1917, IL; d. Aft. 1920. 158. HARRY WARREN11 MASON (LULA EMMEGON10 PERLEY, GEORGE ALLEN9, MARY8 KENDALL, MARTIN7, BENJAMIN6, BENJAMIN5, THOMAS4, THOMAS3, FRANCIS MILES2, JOHN1) was born 12 May 1876 in Gardner MA, and died Aft. 1940. He married JULIA L DOWNEY. She was born Abt. 1877 in CT, and died Aft. 1940.
i. HARRY D12 MASON, b. 21 Dec 1903, Auburn RI; d. Aft. 1920. 163. ii. GEORGE PERLEY MASON, b. 16 Sep 1905, Providence RI; d. Aft. 1940.
iii. CLAIRE E MASON, b. Abt. 1907, CT; d. Aft. 1930. 159. ETHEL LOUISE11 MASON (LULA EMMEGON10 PERLEY, GEORGE ALLEN9, MARY8 KENDALL, MARTIN7, BENJAMIN6, BENJAMIN5, THOMAS4, THOMAS3, FRANCIS MILES2, JOHN1) was born 17 Sep 1878 in Gardner MA, and died Aft. 1940. She married ALBERT H BAGLOE 20 Oct 1897 in Boston MA, son of WILLIAM BAGLOE and ANNA ?. He was born Apr 1870 in Prince Edward Island, and died Aft. 1940.
i. HARRY M12 BAGLOE, b. 14 May 1898, Boston MA; d. Aft. 1940.
ii. HATTIE GRACE BAGLOE, b. 19 May 1899, Boston MA; d. Aft. 1920. 160. ADDIE ELIZABETH11 WHITMAN (SARAH ANN10 POWERS, FREDERICK WILLIAM9, ANNIS8 KENDALL, MARTIN7, BENJAMIN6, BENJAMIN5, THOMAS4, THOMAS3, FRANCIS MILES2, JOHN1) was born 22 May 1878 in Hudson MA, and died Aft. 1940. She married JAMES R LYMAN 02 Feb 1904 in Hudson MA. He was born Abt. 1877 in MA, and died Aft. 1940.
i. RALPH PROCTOR12 LYMAN, b. 23 May 1905, Hudson MA; d. Aft. 1930. 161. BLANCHE H11 POWERS (GEORGE MARTIN10, LORENZO JONES9, ANNIS8 KENDALL, MARTIN7, BENJAMIN6, BENJAMIN5, THOMAS4, THOMAS3, FRANCIS MILES2, JOHN1) was born 26 Dec 1900 in Hubbardston MA, and died Aft. 1940. She married ARTHUR R JOHNSON. He was born Abt. 1898 in MA, and died Aft. 1940.
i. PHILLIP A12 JOHNSON, b. Abt. 1922, MA; d. Aft. 1940.
ii. PRISCILLA R JOHNSON, b. Abt. 1925, MA; d. Aft. 1940.
iii. WARREN H JOHNSON, b. Abt. 1926, MA; d. Aft. 1940.
iv. BEVERLY L JOHNSON, b. Abt. 1933, MA; d. Aft. 1940. 162. GLADYS E11 MINOTT (GEORGE LEON10, ELIZA ANN9 KENDALL, DAVID8, MARTIN7, BENJAMIN6, BENJAMIN5, THOMAS4, THOMAS3, FRANCIS MILES2, JOHN1) was born 06 Dec 1892 in Gardner MA, and died 09 Nov 1983 in Gardner MA. She married RONALD PACKARD BURRAGE, son of LEONARD BURRAGE and M PACKARD. He was born 29 Apr 1893 in Leominster MA, and died 22 May 1981 in Gardner MA. i. RONALD P12 BURRAGE, b. 25 Dec 1921, OH; d. 23 May 1944.
ii. JEAN E BURRAGE, b. 02 Jan 1924, OH; d. 02 Feb 2003, Middlesex County MA; m. WILLIAM C BRITTON; b. 27 Jun 1926; d. 13 Feb 2004, Bedford MA. iii. LAWRENCE M BURRAGE, b. Abt. 1926, OH; d. Aft. 1930.
iv. ROBERT G BURRAGE, b. Abt. 1928, OH; d. Aft. 1930. 163. GEORGE PERLEY12 MASON (HARRY WARREN11, LULA EMMEGON10 PERLEY, GEORGE ALLEN9, MARY8 KENDALL, MARTIN7, BENJAMIN6, BENJAMIN5, THOMAS4, THOMAS3, FRANCIS MILES2, JOHN1) was born 16 Sep 1905 in Providence RI, and died Aft. 1940. He married ? ? in Divorced. i. GEORGE13 MASON, b. Abt. 1931, NY; d. Aft. 1940.
ii. HENRY MASON, b. Abt. 1933, NY; d. Aft. 1940.